​Check here frequently to see what the various divisions in Michigan are doing. We will be posting other news of interest to the AOH here as well. 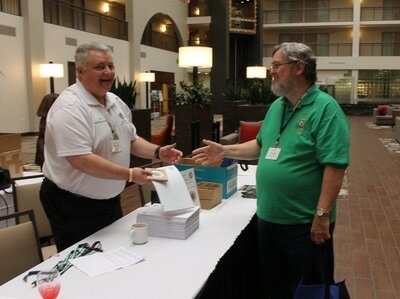 Attached, please find the long awaited AOH Michigan State Convention Brochure. 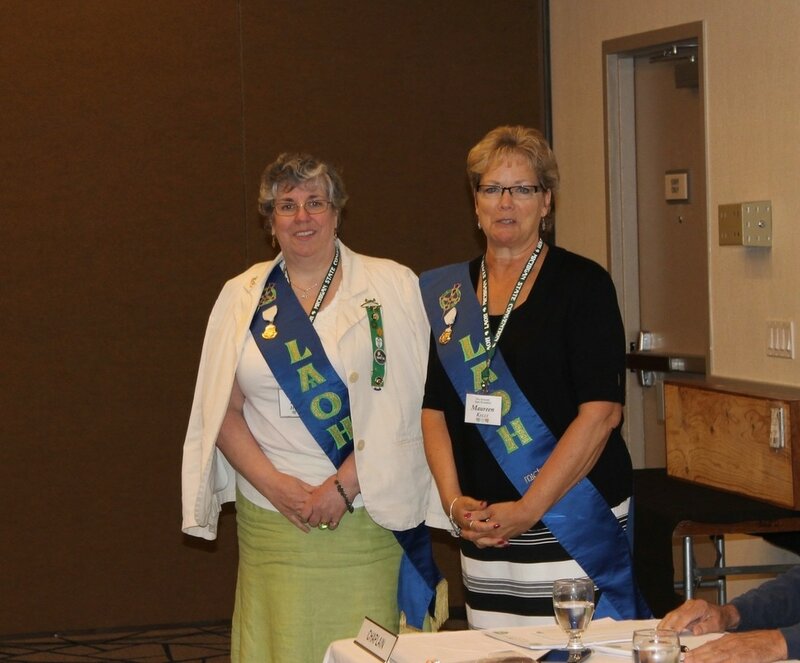 Our convention will be a joint convention with the LAOH on June 21 & 22, 2019 at the Livonia Marriott. The deadline to register for the convention is May 24th. YOU MUST ALSO REGISTER WITH THE HOTEL if you are staying there. See attached brochure. MAJOR DEGREES will be offered on Saturday afternoon. The cost is again ONLY $30 per candidate. 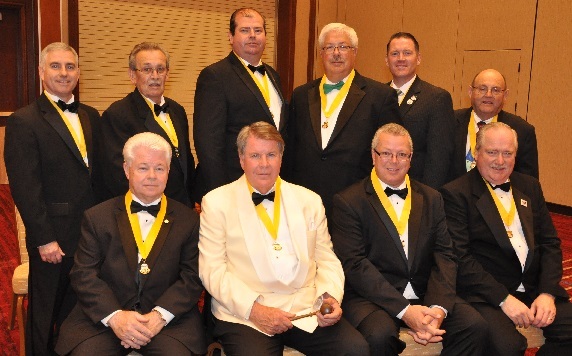 Please note that several divisions do reimburse their brothers after attending the Major Degrees. Act now to attend. It won't be until 2021 before there will be another opportunity to take the Major Degrees in Michigan. Please distribute to all your members and make this an agenda item for your next meeting. 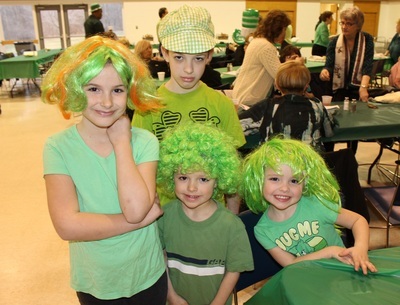 Sunday - March 17, 2019 - HAPPY ST. PATRICK'S DAY! A regular tradition in Detroit on St. Patrick's Day is the annual "Sharin' of the Green" Mass at Most Holy Trinity Church in Corktown. The Archbishop of Detroit, Allen Vigneron, or one of his auxiliary bishops always celebrates the Mass and many Detroit and State of Michigan politicians and dignitaries are regular attendees. 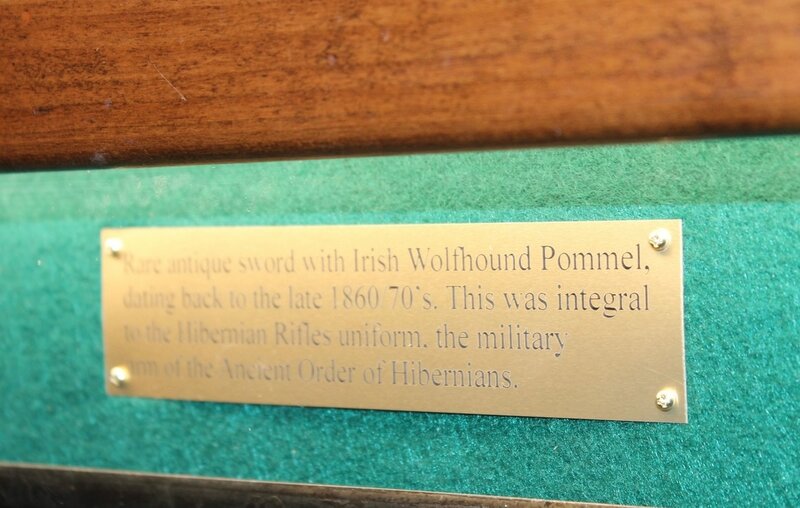 Part of the tradition is that the Archbishop will be escorted into and out of church by the AOH Hibernian Riffles. It was not different today. 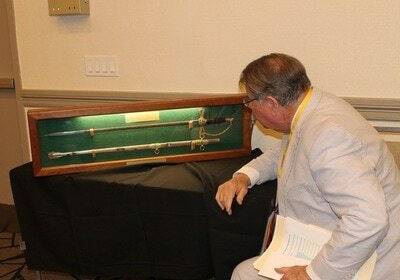 The archbishop was kind enough to pose for a picture with the Riffle after Mass. The Riffles, made up of members from several state AOH divisions, are looking good in their authentic civil war era uniforms too! Monday - March 11, 2019 - Despite the weather not completely cooperating (cold, windy, rainy), the Irish were out celebrating Irish Heritage at the Detroit St. Patrick's Parade yesterday in Detroit. 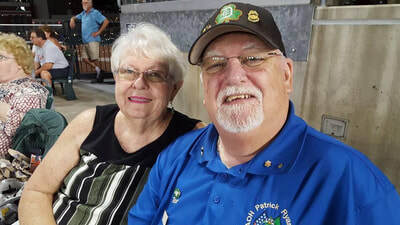 Congrats to Paul & Agnes Gowdy for being selected as the Grand Marshals of the 2019 parade! Friday - March 8, 2019 - The Detroit St. Patrick's Parade is this weekend...Sunday, March 10th in Corktown! 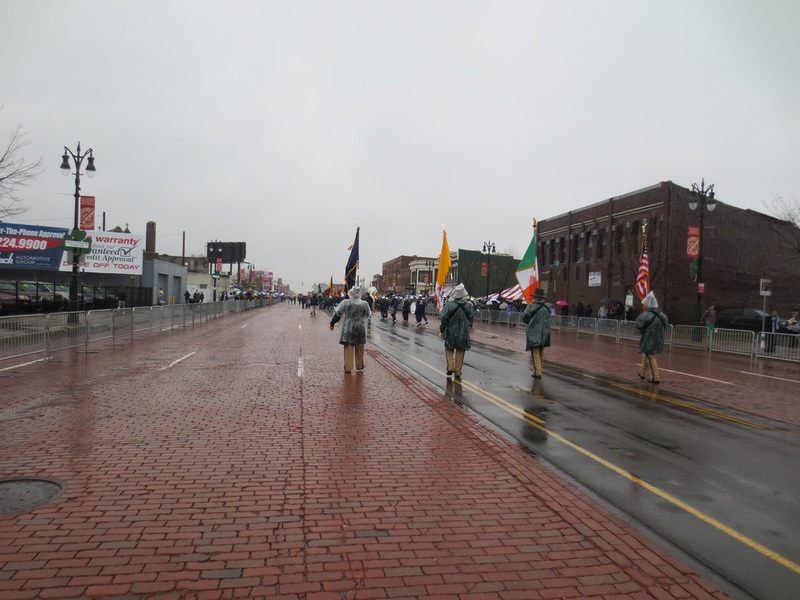 Attached is all you need to know about the parade, including marching order of all parade entries. 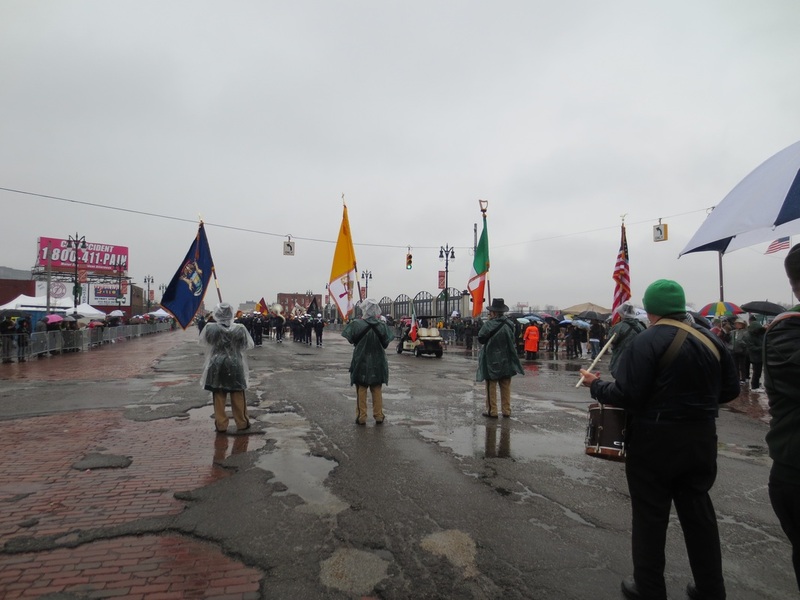 Virtually all of our AOH and LAOH divisions and organizations are marching in the 6th Division (basically at the back of the parade line). If you are marching, enjoy the march and bring your "happy face" with you! If you are a spectator this year, enjoy the parade! 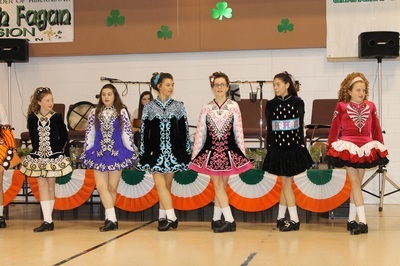 Keep the celebrations going after Parade Day at brunch with our Cork Dignitaries! 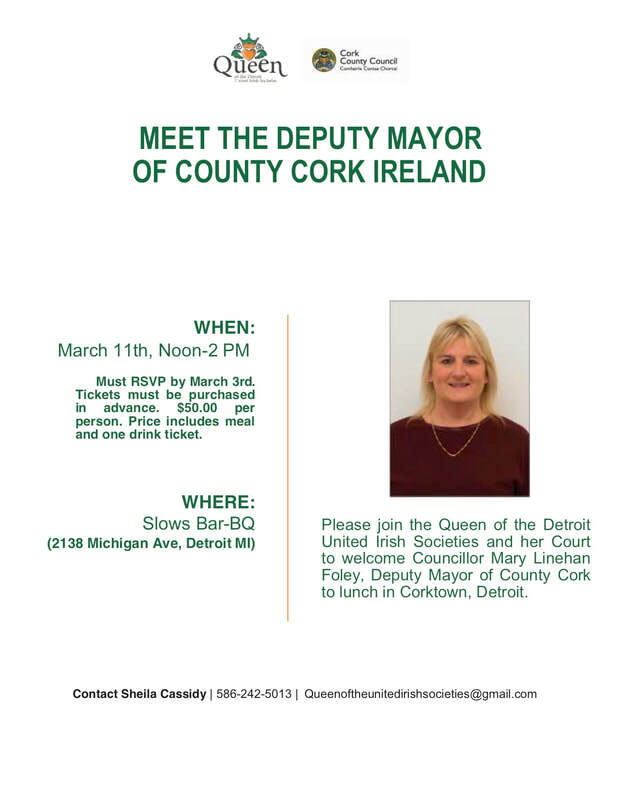 On March 11th the Queen of The United Irish Societies is hosting our guests at Slow’s Bar BQ! 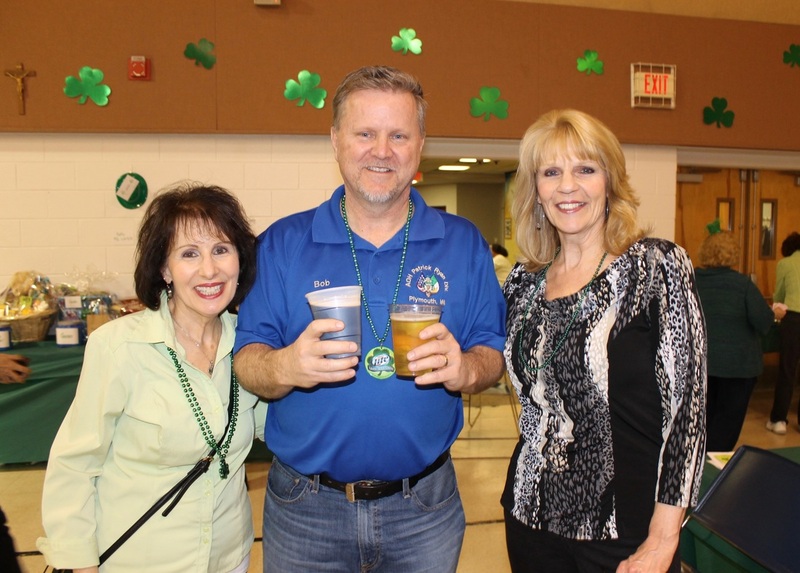 Get your tickets ahead of time which includes a meal and one drink ticket! 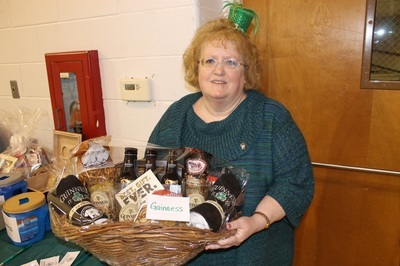 Email or call Sheila Cassidy by March 7th, at the latest, to claim your spot! You won’t want to miss out on this great event! 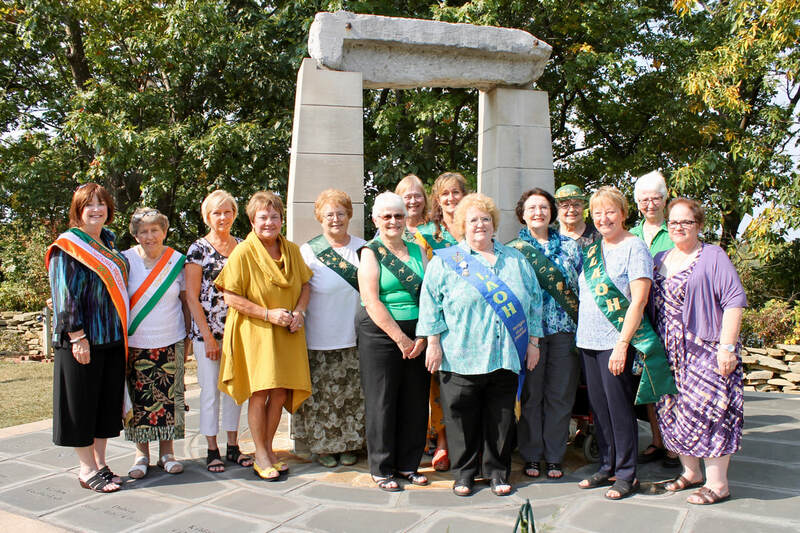 Wednesday - January 9, 2019 - QUEEN OF THE UNITED IRISH SOCIETY...Do you know a young lady who would be interested in becoming an Irish Queen? 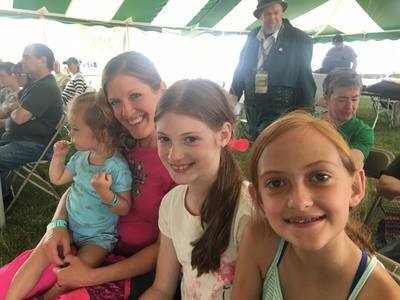 A daughter, a grand daughter, a niece, a friend? If so, please share this information with her and encourage her to participate in this year's selection process. Hello all. 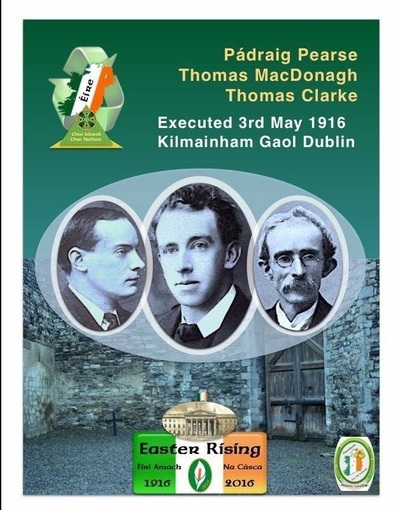 As Leaders in the Irish Community, please consider taking an active part in this event. The Rose Kennedy LAOH is in the planning stages of Heritage Day. 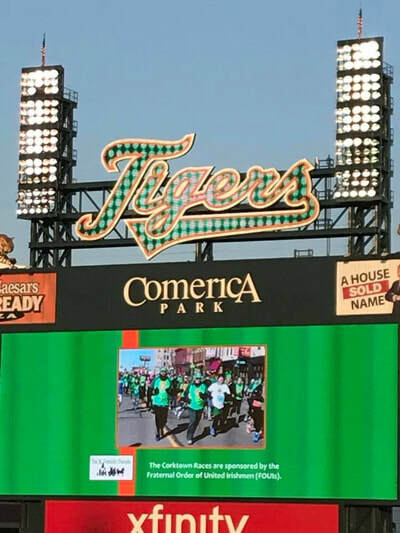 Please consider having your Division represented by displaying special information about your specific Division, charitable events that you sponsor, applications for new members, whatever you wish. 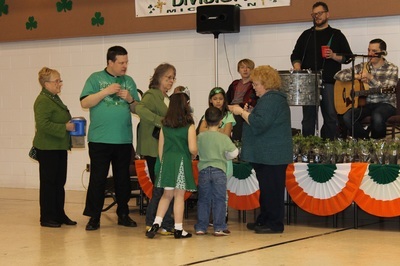 This is your day too, so, consider joining us at the AOH Hall with YOUR DIVISION. 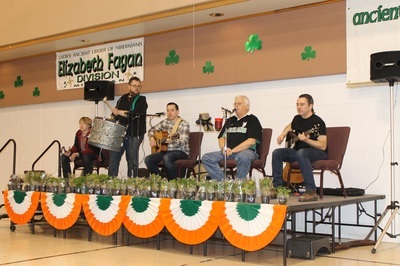 Also, if you know of anyone with special Irish Heritage items, stories, talents, songs, and more, who may wish to participate, please encourage them to join us on March 3. 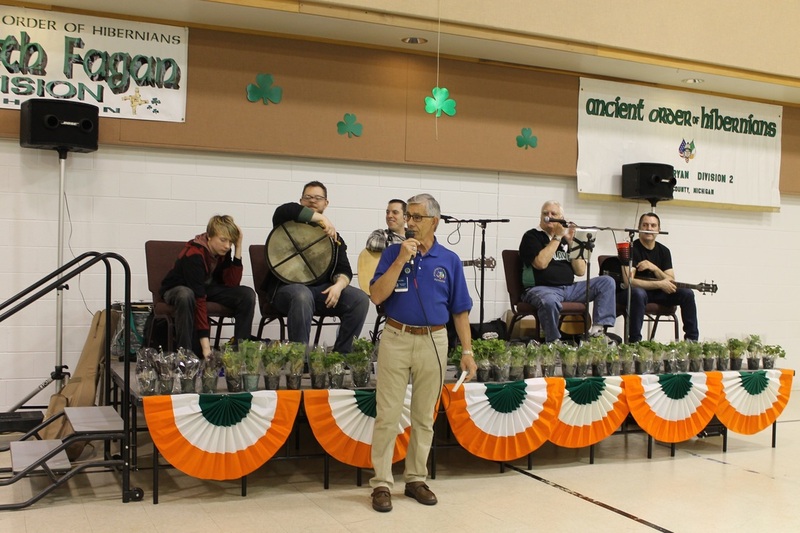 We are in need of "special Irish people with special Irish talents" to educate and entertain us. 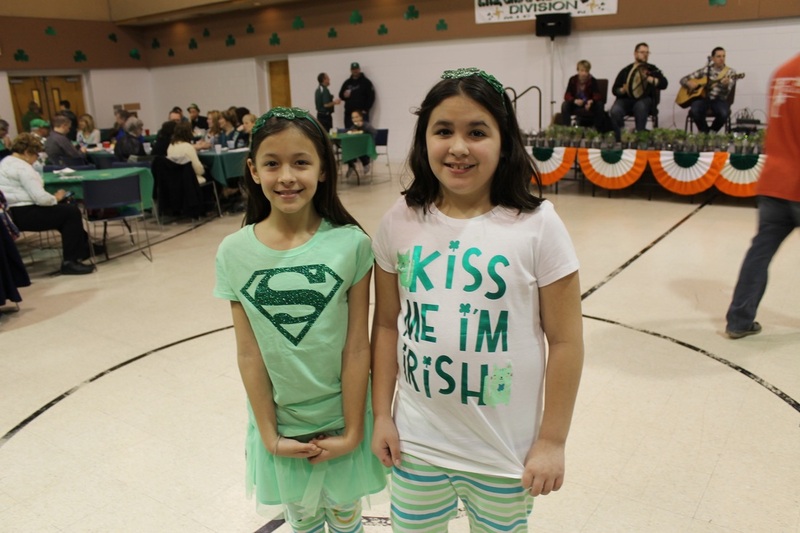 Let's keep our Irish eyes smiling! Monday - December 24, 2018 - Merry Christmas from the AOH Michigan State Board! Nollaig Shona! This is a friendly reminder that our next AOH State Board Meeting will be 7:30 pm, Monday, December 17, 2018, at the AOH Walsh Division Hall in Redford Michigan. All divisions should attend. If you cannot send a representative, please let me know. Yay! It’s on time. A little shorter this time. Look for an all new layout for 2019! 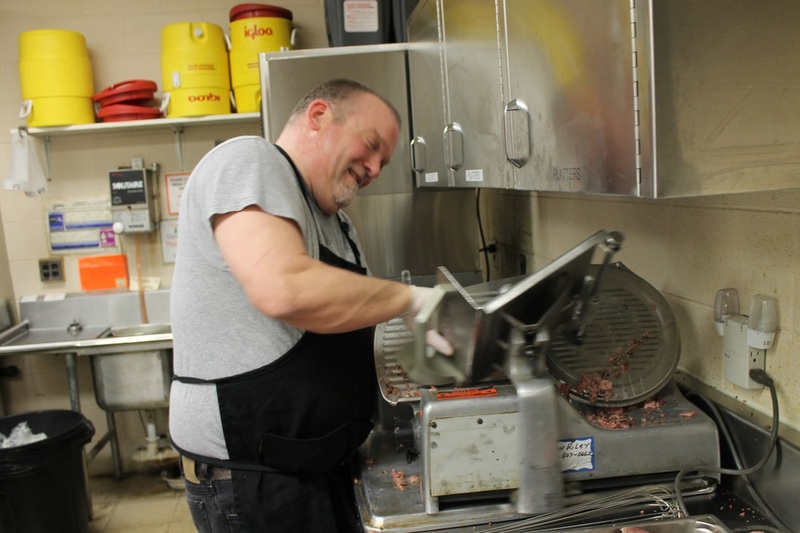 Don’t forget the Steak Dinner and Comedy fundraiser for local Veterans tomorrow evening. 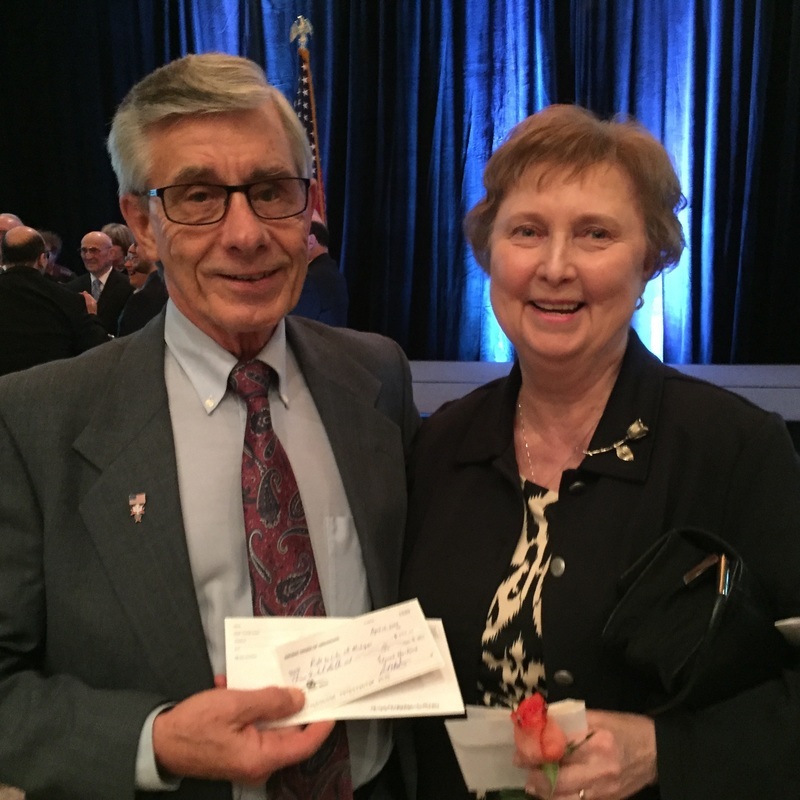 Friday - November 16, 2018 - Congratulations to Paul & Agnes Gowdy (AOH Fr. Solanus Casey Division, Macomb County) as the 2019 Grand Marshals of the United Irish Societies. 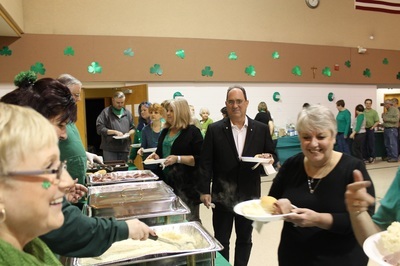 Your lifetime dedication & contributions to the Irish Community are endless. 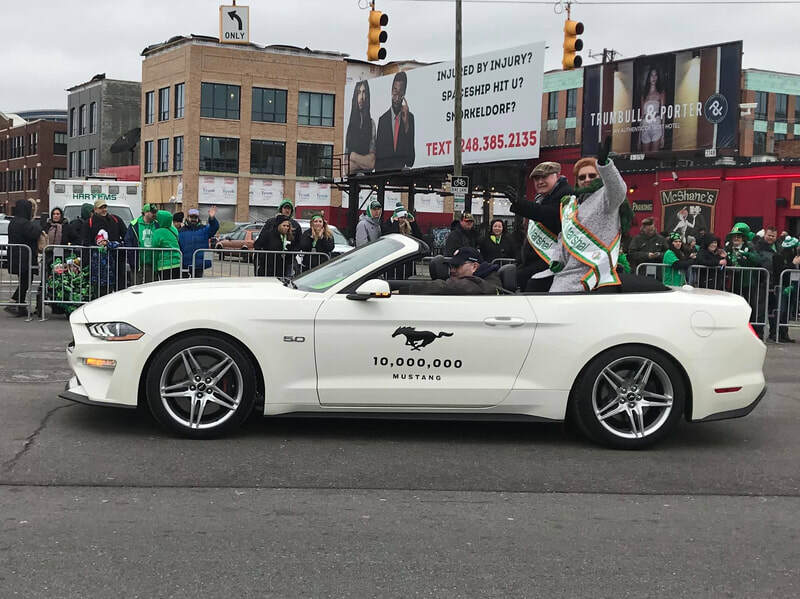 The 2019 St. Patrick’s Parade theme is "Corktown, Where Detroit Meets Ireland". 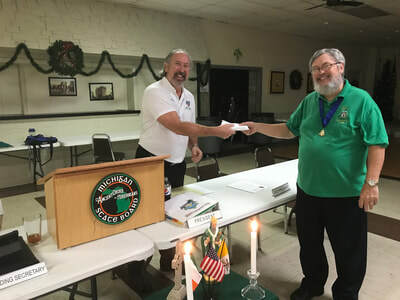 ​The AOH Patrick Ryan Division of Plymouth, Michigan will be celebrating the 40th anniversary of the granting of their charter on November 30th this year. 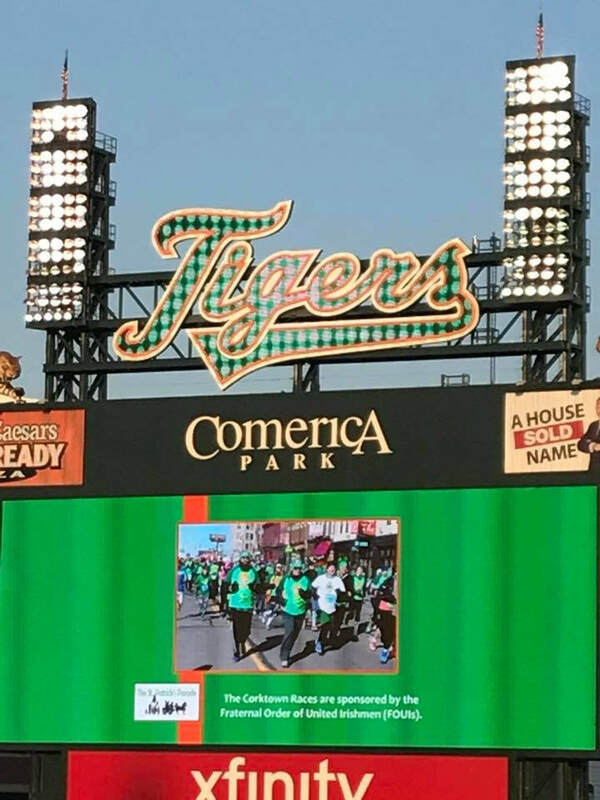 The division was founded in Detroit in 1978 and the charter granted on November 30, 1978. 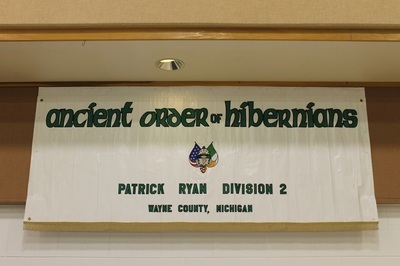 Here's an excerpt from their website (www.aoh-patrickryandivision.org) with more information on their formation. Here is that piece from this book published nearly 20 years ago. Thursday - November 1, 2018 - On this All Saints Day 2018, let us remember the patron saints of Ireland. 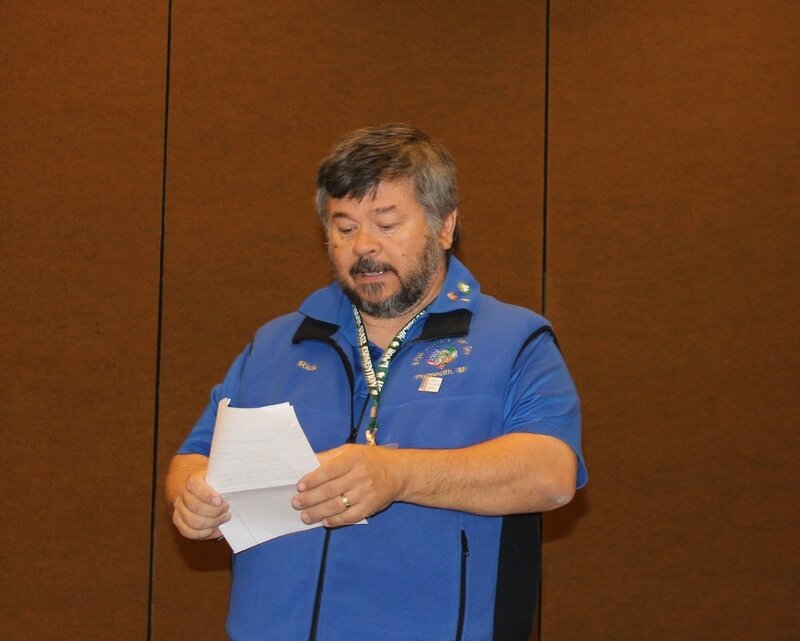 Please see the email below where our State Board Catholic Action Chairman Chris Scanlan asks each division president and financial secretary to send him the names of your deceased members for the past two years. "We don't want to miss anyone". 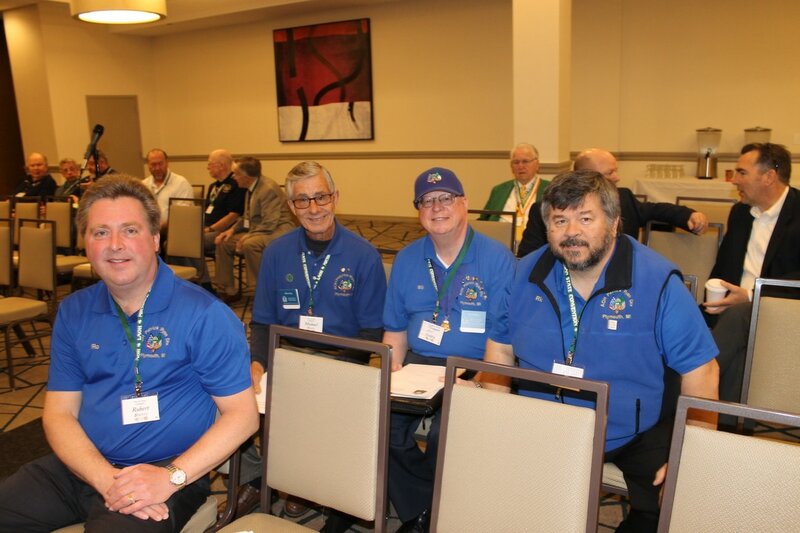 Tim, Please send out the request again to Division Presidents, to have their FS go over their membership lists to send us deceased members from their Divisions for last 2 years, so we don't miss any one. 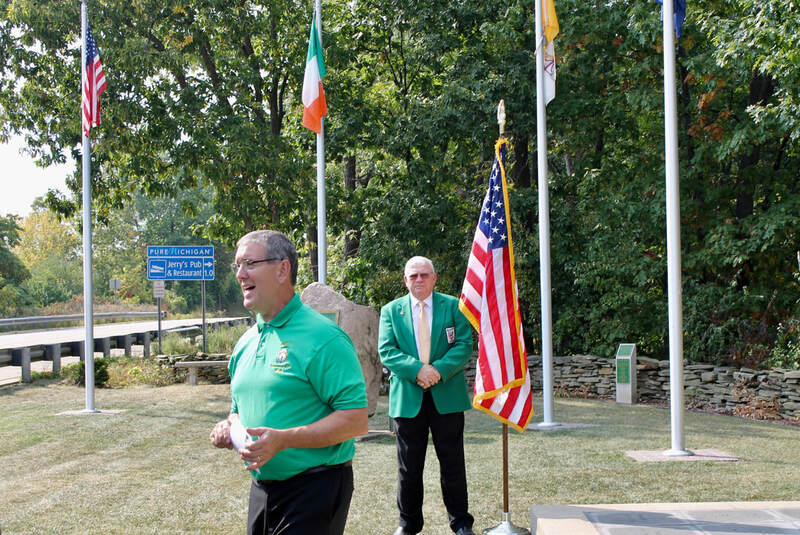 Please find the attached Newsletter for October, as well as a list of events coming to a Hibernian hall near you. 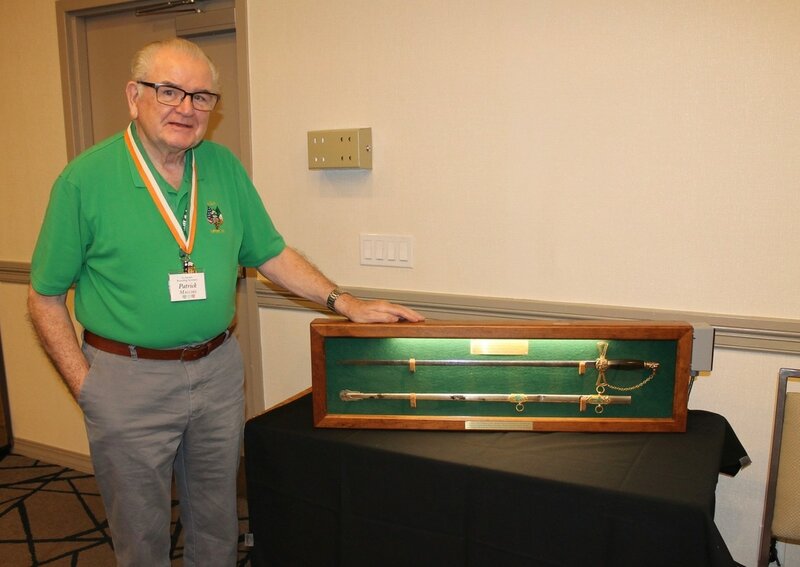 It is with a heavy heart to share that Thomas McNabb, Past National President and National Secretary Emeritus passed away peacefully last night, surrounded by family. The patriarch of the McNabb Family and a pillar of the Auburn and Hibernian Communities alike, he will always be remembered as Dad, Pop Pop, Councilor and Mr. Hibernian. Rest in Peace Brother Tom McNabb. Sunday - July 15, 2018 - Congrats to the newly elected AOH National Board, elected and installed at this week’s biennial convention in Louisville! 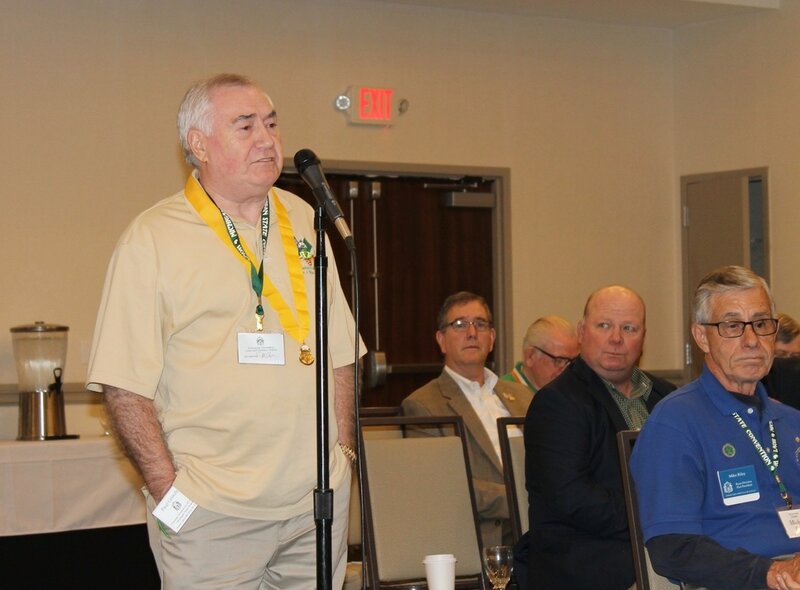 The 2022 National Convention will be in Pittsburgh. 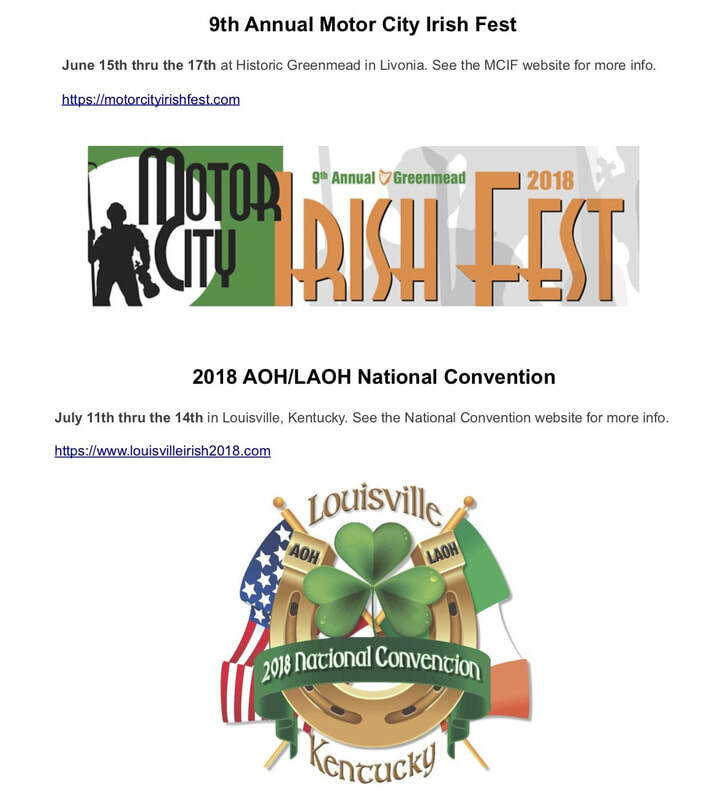 Sunday - June 10, 2018 - Don't forget about these big upcoming events! Wednesday - May 30, 2018 - At the AOH Hall in Redford, tomorrow night! 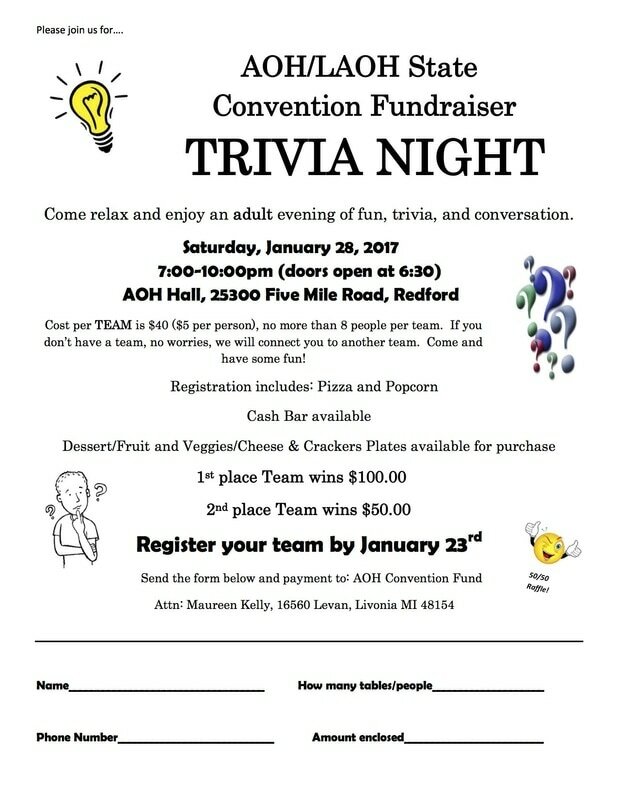 Come and support Walsh Division fundraising! 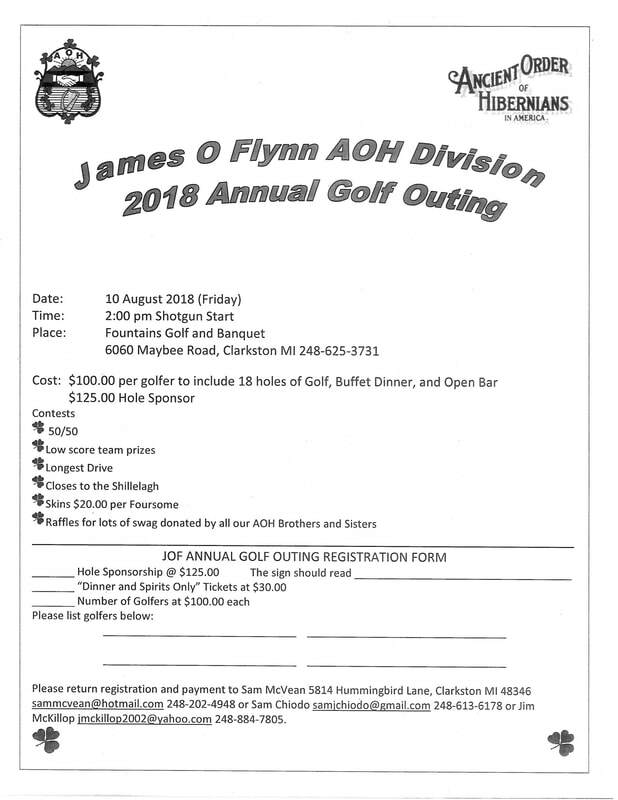 Please see attached flyer for this years outing. Hope to see everyone there. Save the date: August 10, 2018, Fountains Golf & Banquet in Clarkston (golf 2:00 pm, dinner/spirits 6:30 pm). 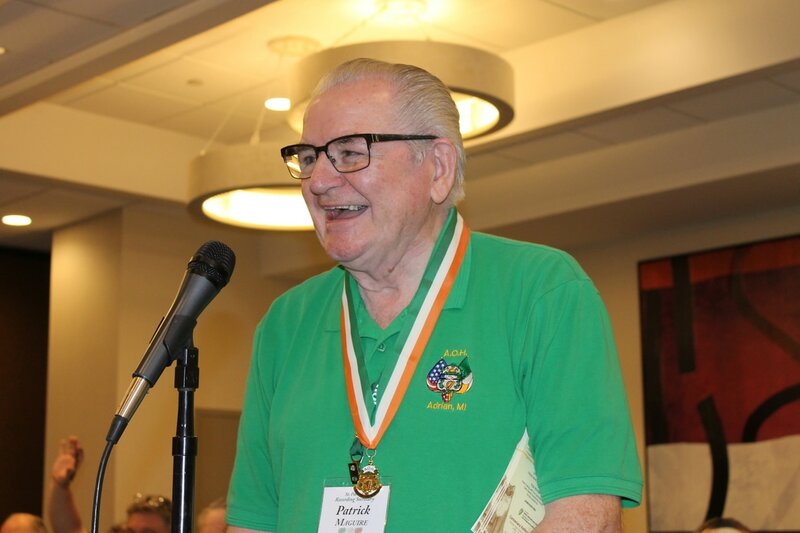 It is with great sadness that we forward to you the email below from our National FFAI Chairmen Paul Gowdy about the passing of Billy Byrne to eternal life. Please read below and inform your membership. Brother Billy Byrne was a great Hibernian. 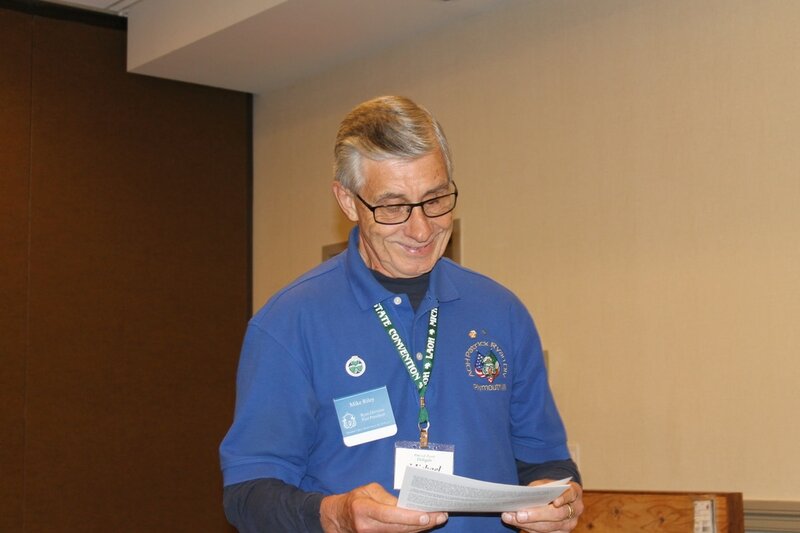 Besides being an AOH Past National Director, AOH Past Michigan State Board President and AOH Solanus Casey Division President, he was my AOH mentor and friend. Brothers. 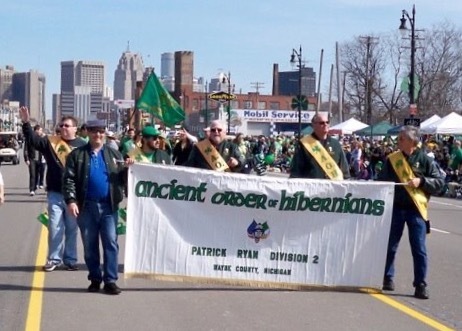 I just got the news that our Hibernian Brother Bill Byrne passed away last night on the eve of his 82nd birthday. The family had a birthday party for him this past Sunday and he was chipper. 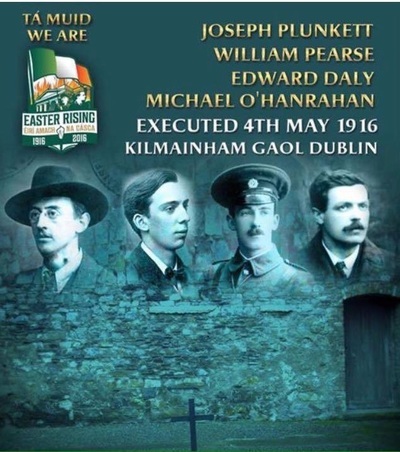 The Diggers were there and sang a collection of Dublin songs. 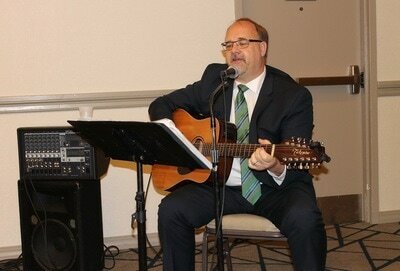 Bill joined in the singing and had a great time. 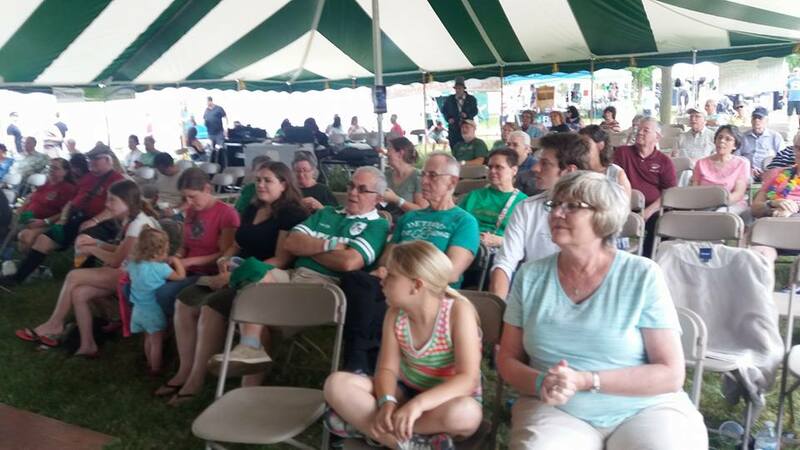 It was a fitting event sharing the celebration with quite a crowd of family and friends. 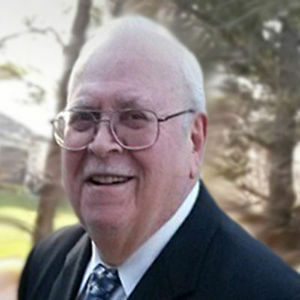 John Byrne called me and when he has the funeral details I will share them with you. 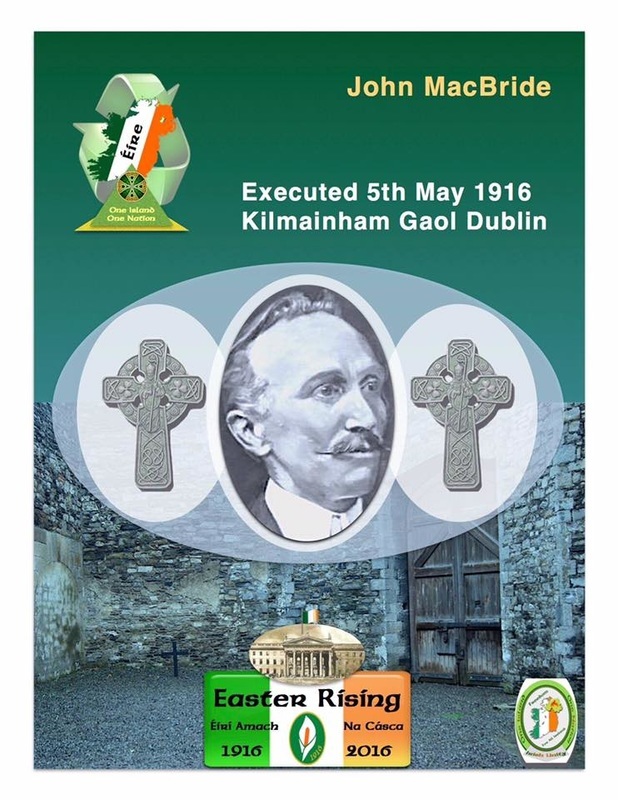 "God Bless our Billy". 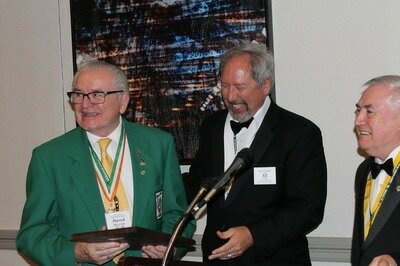 He was a wonderful friend and Hibernian. Please keep Past Michigan State Board President Billy Byrne in your prayers. Recently brother Bill Byrne came down with an attack of 'shingles'. As bad as that was, last week he fell and badly hurt himself. As a result he ended up in hospital. Yesterday, I was told that he had suffered a heart attack at the weekend while in the hospital. Hospital visitations are restricted at this time. 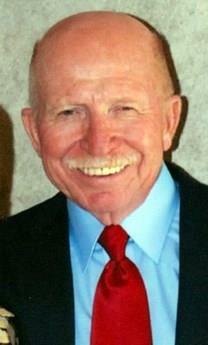 Please keep Bill in your prayers. I will continue to pass on to you any updates that come my way. 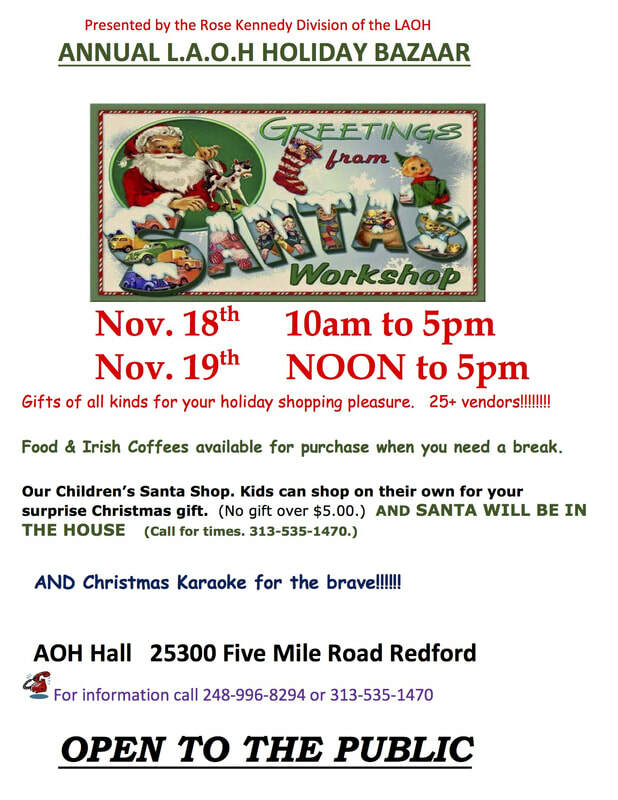 Please share this update with any AOH/LAOH contact lists. 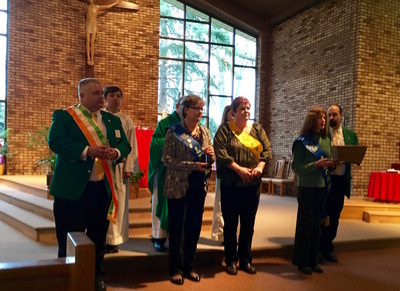 Saturday - March 17, 2018 - Below is a photo of the AOH Michigan Riffles falling out with Bishop Battersby at the "Sharin' of the Green" St. Patrick's Day mass at Most Holy Trinity Church in Corktown (Detroit). Pictured from left to right, the Rifles are Brian Murphy, Bob Yancey, Mike Riley, Patrick Murphy and Joe Bittner. Most Reverend Battersby was ordained Bishop January 25, 2017. 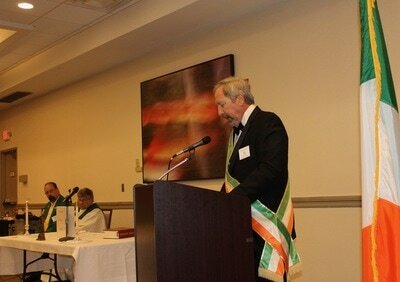 This was the first St. Patrick's Day mass he attended. 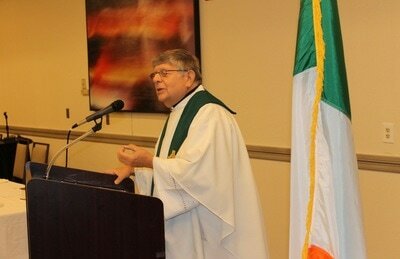 He gave a great homily reviewing his Irish roots also. In the 1800’s, the largest concentration of Irish Battersby's were located in the Dublin area, principally in Loughbawn County, Westmeath and Smithstown County, Meath. It is from there around 1850 (during the great Irish immigration prompted by the Potato Famine) that Bishop Battersby’s paternal great-grandparents the Battersby and Mullally’s immigrated to Essex County in Windsor, Canada. 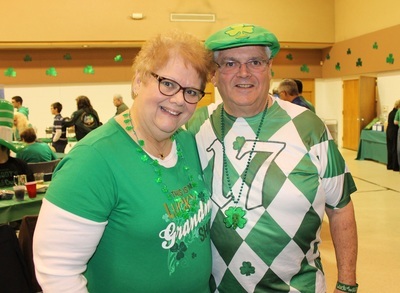 The Bishop’s maternal great-grandparents, the Buckley’s and theMcIlhargey’s settled in Lucan, Ontario near London about that same time. Bishop Battersby’s parents, the late Christopher and Helen (Buckley) Battersby, came to the United States from Canada in 1929 and 1925, respectively. 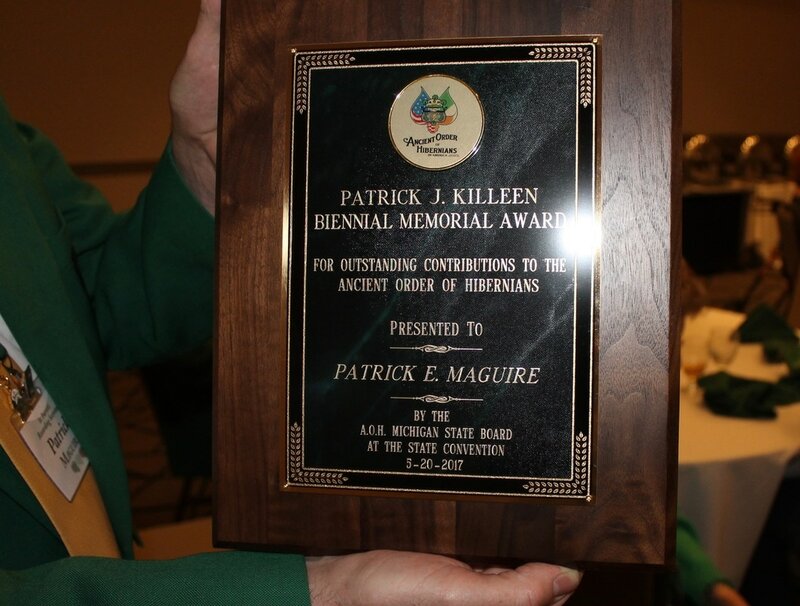 Thank you Past AOH Patrick Ryan Division President Mike Riley for supplying this information! 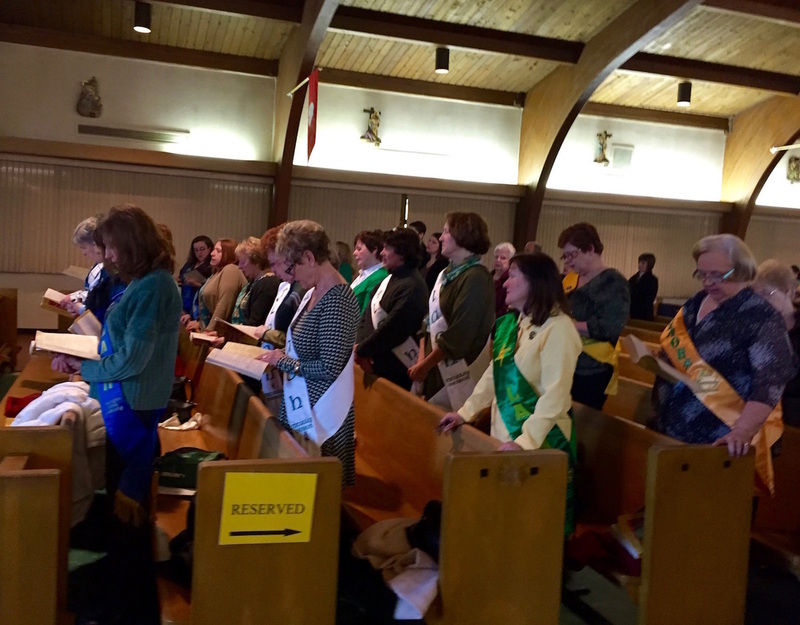 THIS SUNDAY is the LAOH St. Brigid Mass. You don't want to miss this. Mass is Sunday, January 28, at 3:00 pm at the AOH Walsh Division Hall. Light refreshments will be served after Mass. 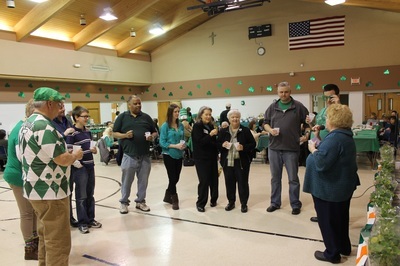 I'd like to see you and your bothers at the Mass. 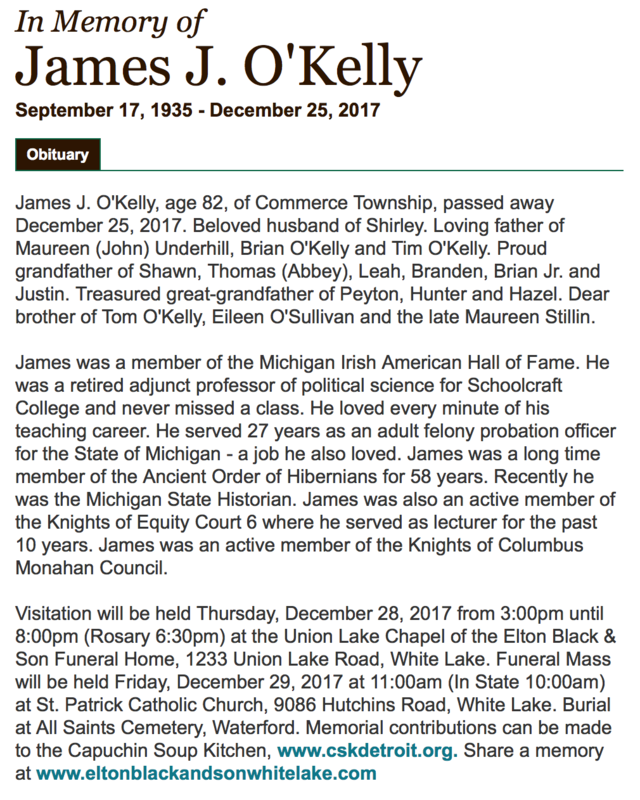 Tuesday - December 26, 2017 - It's with sadness that we must report the passing of Jim O'Kelly, longtime Hibernian and present AOH Michigan State Board Historian. 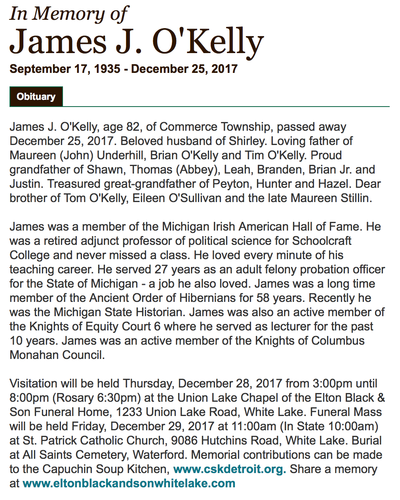 Jim will be very much missed by the Michigan Irish community. 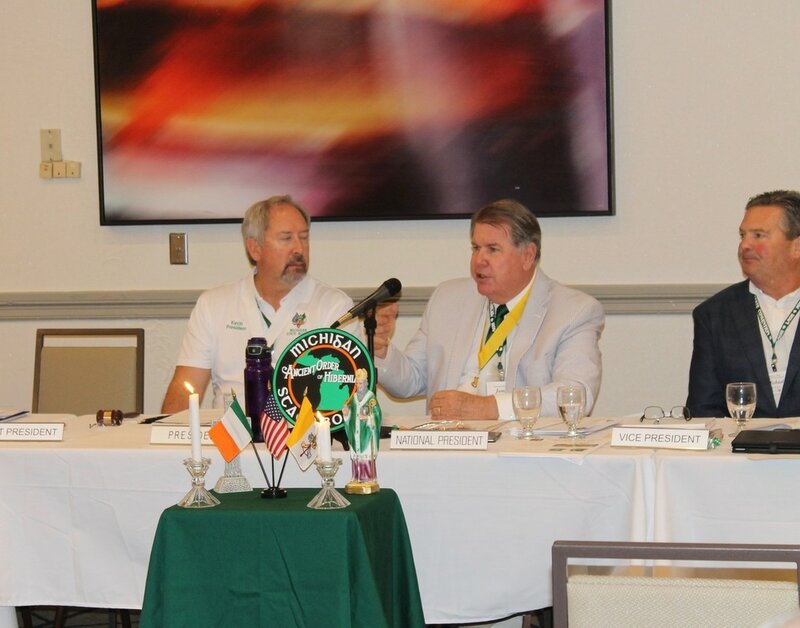 Please see the attached file and email below forwarded by FFAI National Chairman Paul Gowdy. 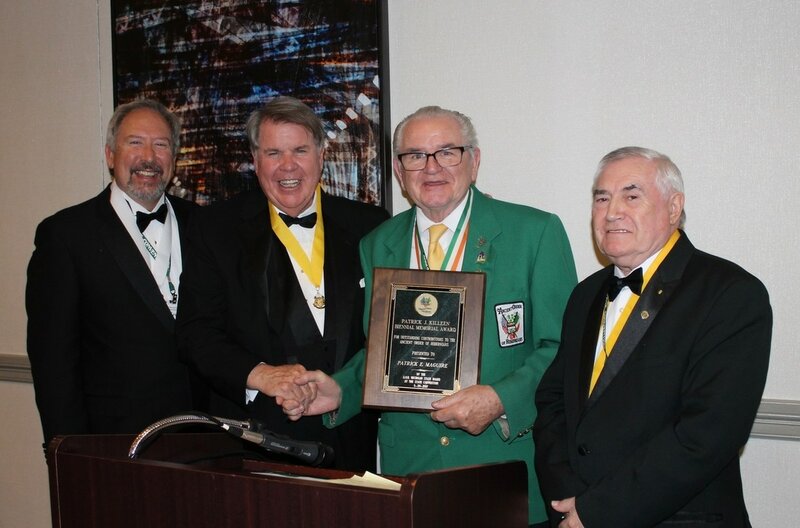 Brothers, please share with the AOH Boards in your state, this attached Newsletter from our friends in the Conway Mill Trust. They receive a donation from our Annual FFAI Christmas Appeal and along with their own donations support community organizations in N. Ireland, especially the Belfast Conway Mill organization . Remind your members that thanks to their generous donations, this is just one of the organizations that our Annual FFAI Christmas Appeal supports. 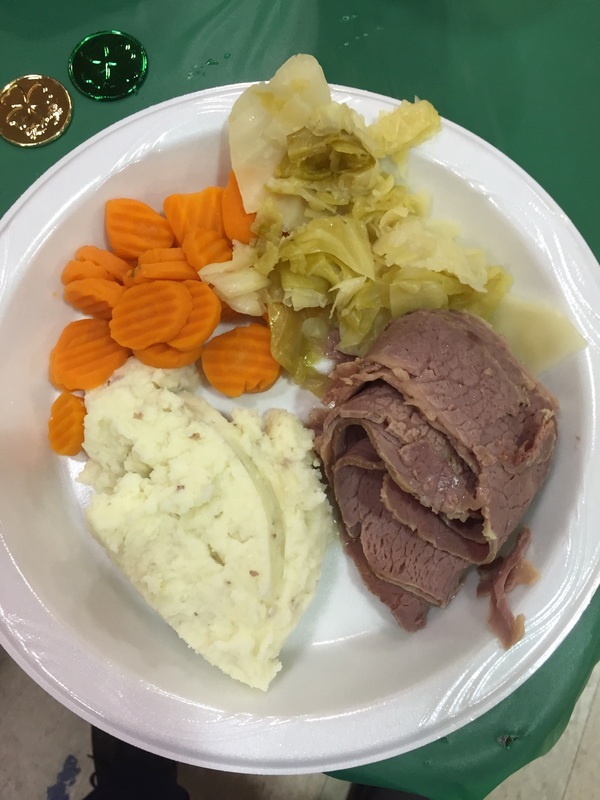 Attached is our latest newsletter with news from the community groups in Belfast, Derry and Portadown that Conway Mill Trust supports for your reading pleasure. Please feel free to share the newsletter with friends and family. If for any reason you are unable to open the attachment, please advise us. Wishing you and your family a joyous and happy holiday season and a healthy and prosperous 2018! 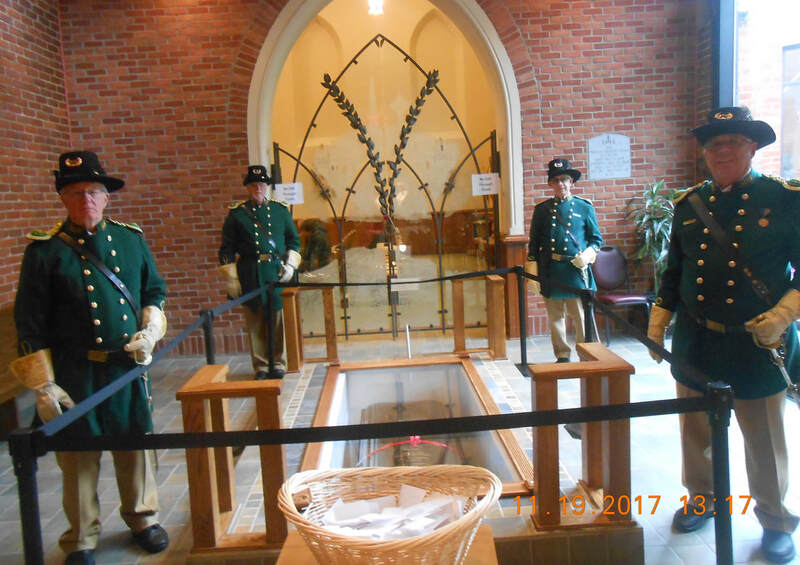 Sunday - November 19, 2017 - The AOH Hibernian Rifles stood guard (see photo below left) for 1 hour at Blessed Fr. Solanus Casey's tomb today at the Solanus Casey Center in Detroit. We alternated with Fr. 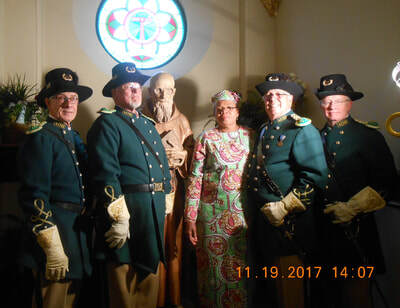 Solanus Casey Division brothers and LAOH sisters at the tomb. The total time all of us stood at the tomb was from 10 AM to 1 PM. 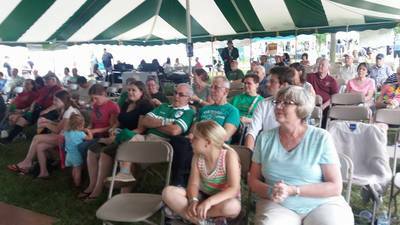 There was a 9:00 and 11:00 am mass at the Center. 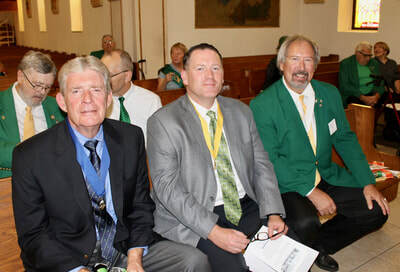 Brothers John McInerney, Dennis Inman, Tim Reade and Mike Riley represented the Rifles. The other photo (below right) at the Blessed Casey statue includes the Rifles with Paula Medina Zarata. She experienced a miraculous healing from a severe skin condition. 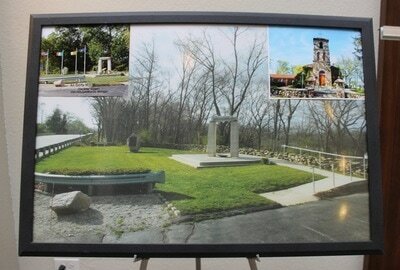 It paved the way for approval of Blessed Casey's beatification by the Vatican's Congregation for the Causes of Saints. 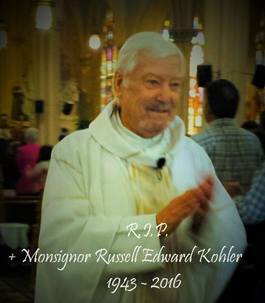 Saturday - November 18, 2017 - Fr. Solanus Casey Division brothers and LAOH sisters along with members of the Michigan State Board were pleased to be present at the beatification ceremony today for Blessed Solanus Casey. 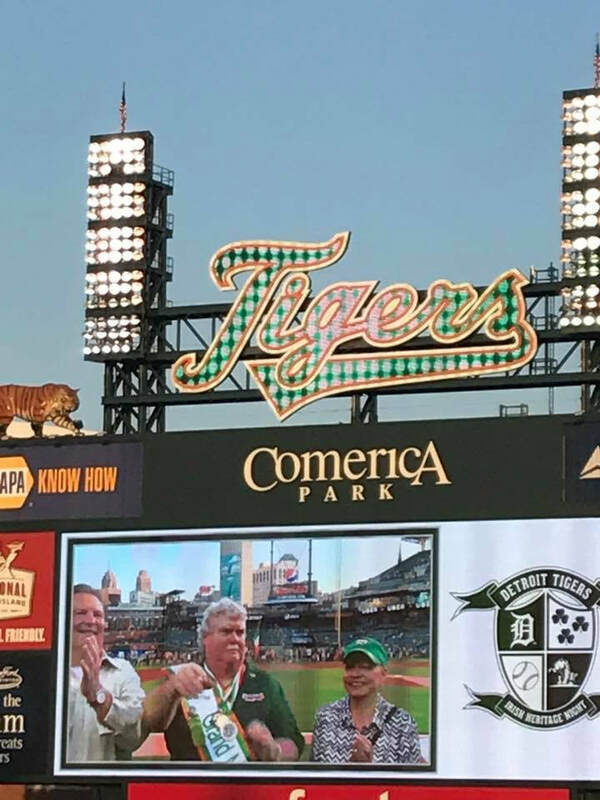 Ford Field in Detroit was packed with those wanting to be a part of this historic event. Even a Fr. O'Connell flew in from County Limerick, Ireland to be a part of the festivities. He is pictured (below right) with a group of AOH brothers and others. 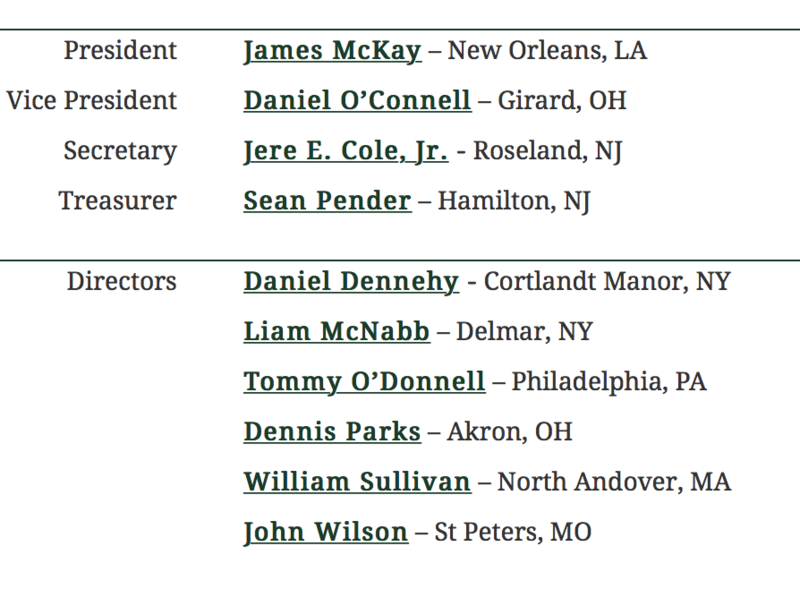 11/15/2017 - Brother Presidents & Financial Secretaries - Attached are Excel versions of these two important forms that need to be completed soon by your division. You will likely find these Excel versions easier to work with than the forms currently provided on the National website (aoh.com). However, if you prefer, you may use those fillable pdf forms. 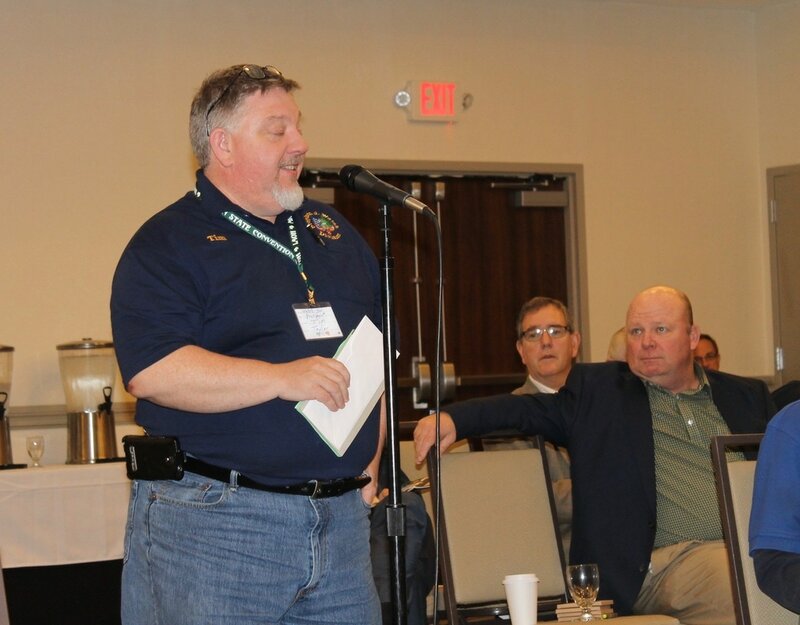 Form 9 Election of Officers - Please complete this form asap after the election of your new division officers effective 1/1/2018. Most of you have already done your elections, so can can send these Form 9's in now. Send copies to me and to Jere Cole (AOH National Secretary) either via snail mail or email. Form 11 Division Membership & Financial Report - This report is due to State and National boards by 2/15/2018. Again, copies need to go to me and to Jere Cole. Your "per caps" payments should come with these forms. Per caps charges remain $12 per member for National, $10 per member for State. Should you have any questions about the completion of these forms, please let me know and I will be happy to assist you with that. Same thing if you have any trouble using these Excel versions. 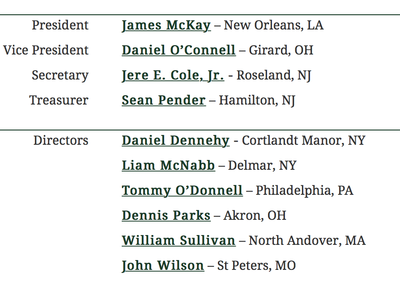 ps: If you are no longer in one of these positions, please pass this communication on to your successors so they can respond to me accordingly. Thx. 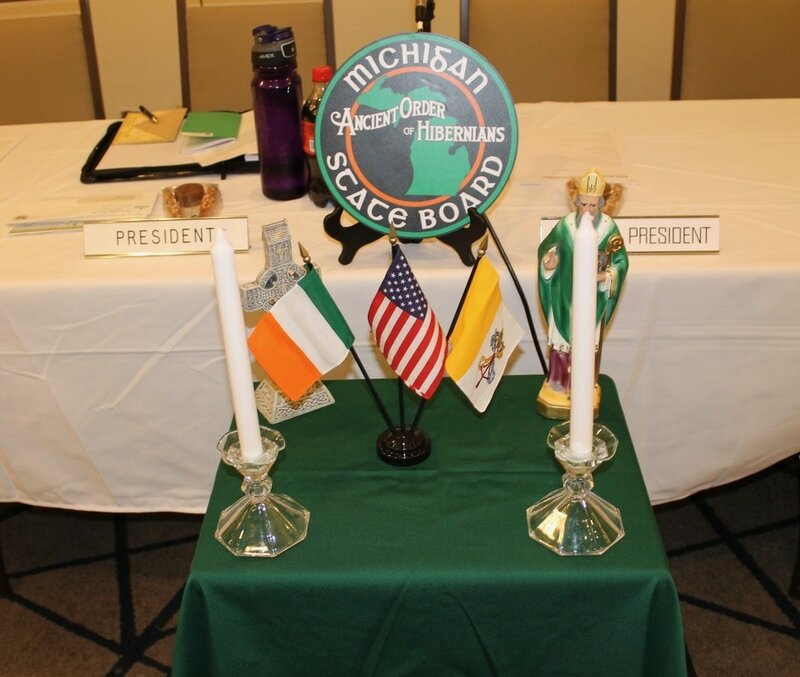 The next state board meeting is scheduled for 7:00pm, Wednesday, December 6th, at the AOH Walsh Division Hall; 25300 Five Mile Rd., Redford MI 48239. Each division or county board should send a representative. 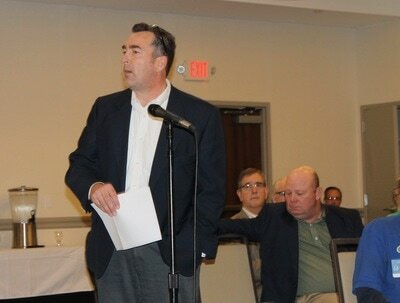 If your division or county board won't be represented, please respond letting me know. SAVE THE DATE! 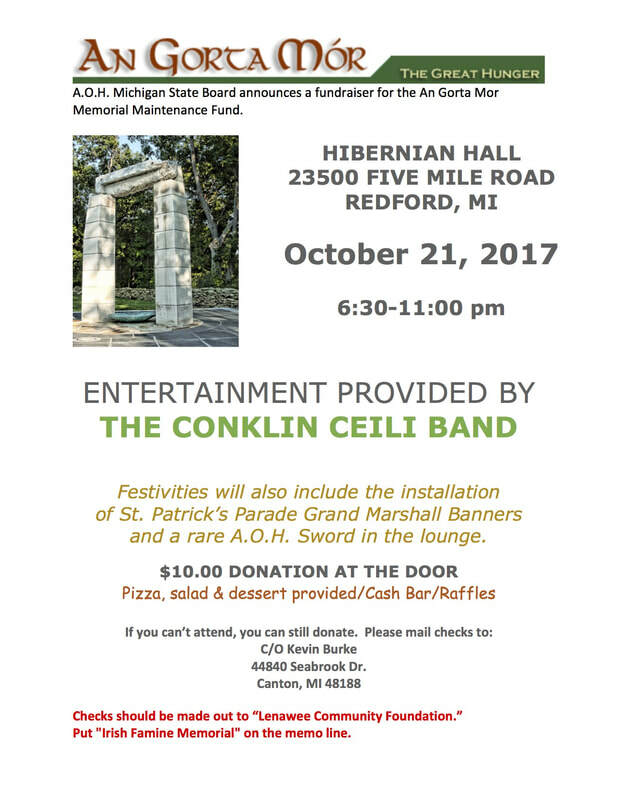 There will be a Fundraiser for the An Gorta Mor Monument (The Great Hunger or Potato Famine) Maintenance Fund on Saturday, October 21st, at the AOH Walsh Division Hall in Redford Michigan. Volunteers are asked for from each division to help plan this event. Those who are willing to help plan, do let me know by email before 8pm on this Monday, Labor Day. Also, please share this information with your membership for the widest possible distribution. Since this is the ONLY An Gorta Mor Monument in Michigan, and because it's construction was the vision on the AOH St. Patrick Division in Adrian, it is incumbent upon us to ensure that it is maintained into the future. 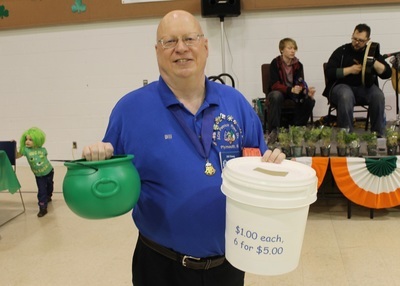 Divisions should also consider making a donation to the Maintenance Fund. Please contact me for details. 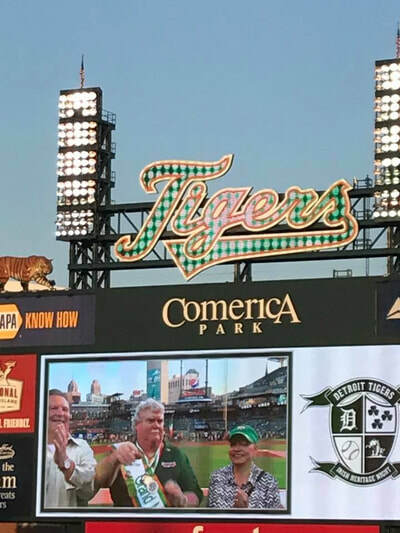 Friday - September 22, 2017 - Well, the Tigers lost again, but a fun time was had by all anyway at the UIS Irish Night at Comerica Park tonight. 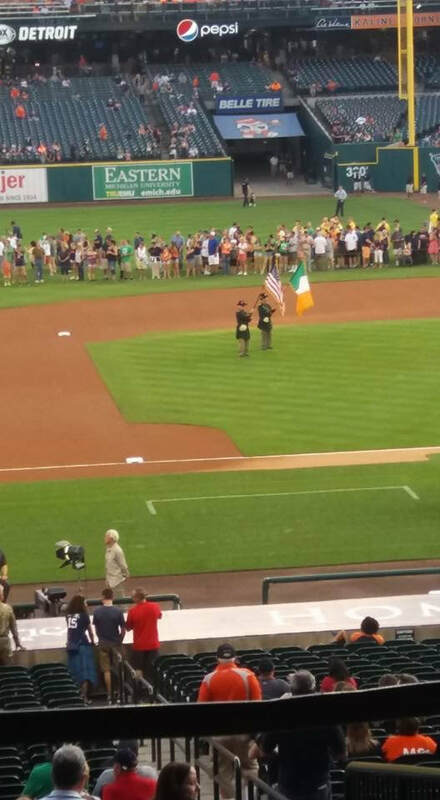 Here are a few glimpses of the action at the game. 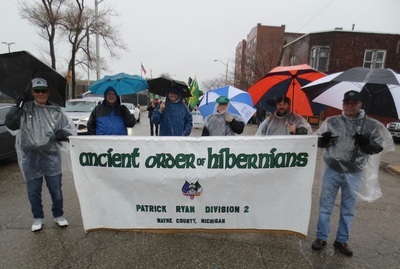 Several AOH & LAOH divisions were represented as were the AOH Hibernian Riffles. 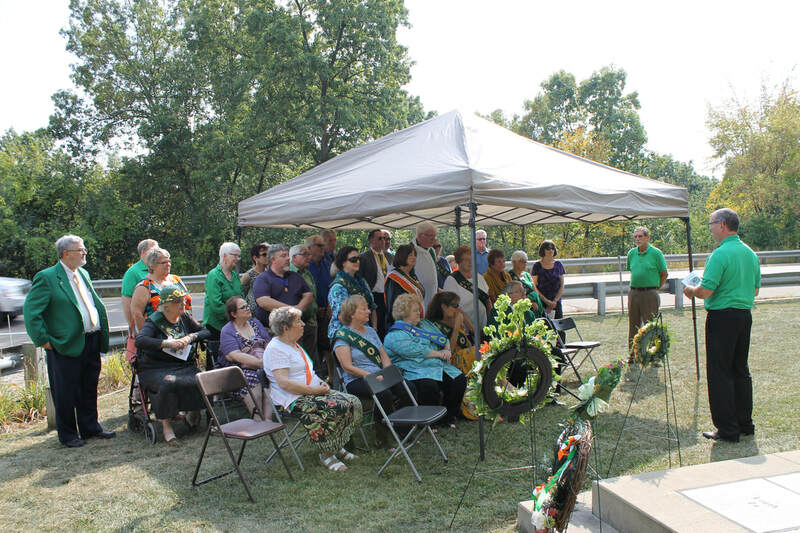 Sunday - September 17, 2017 - Congratulations to the men and women of our Adrian AOH & LAOH divisions who put together a wonderful commemoration program remembering An Gorta Mor (the Great Hunger) today at St. Joseph's Shrine in the Irish Hills of Michigan. Fr. 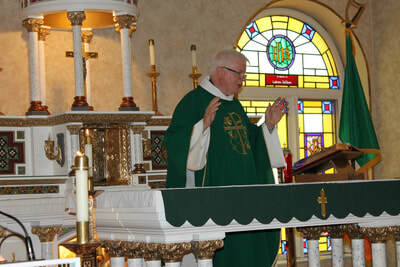 Tom Murphy, pastor of St. Mary's and St. Joseph's in Adrian, was the celebrant of the memorial mass. 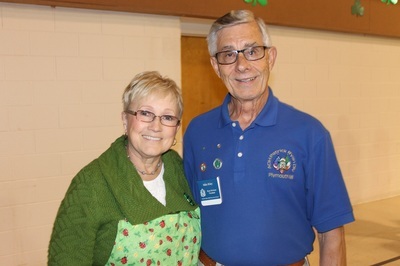 There was a good turnout of AOH and LAOH members and their families, and we were very pleased to have our AOH National Director, Dennis Parks, drive up from Akron, Ohio to be with us as well. 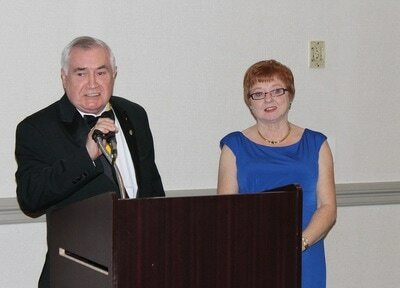 Ed Moriarty of AOH Akron Division #2 accompanied Dennis to be with us too. Also present were AOH Michigan State Board President Kevin Burke, LAOH Michigan State Board President Barb Weir and Past LAOH National President Maureen Shelton. 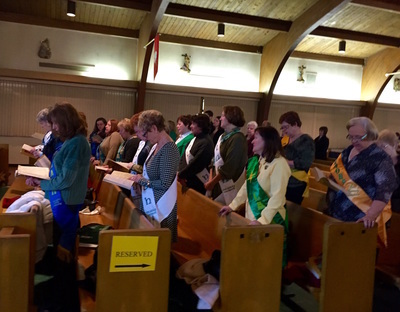 Below are a selection of pictures from the Mass and program. 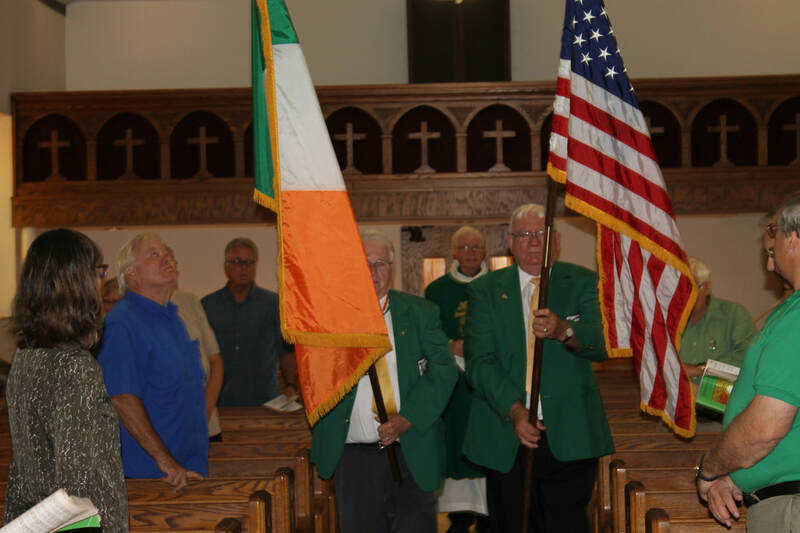 The Annual An Gorta Mor Mass is scheduled to take place at St. Joseph's Shrine on Sunday, September 17, at 2:30 p.m. The Shrine is located in the heart of the Irish Hills on Rt. 12 in Brooklyn, Michigan. Fr. Tom Murphy, Pastor of St. Mary's and St. Joseph's Church in Adrian, will be the Celebrant of the Mass. Fr. 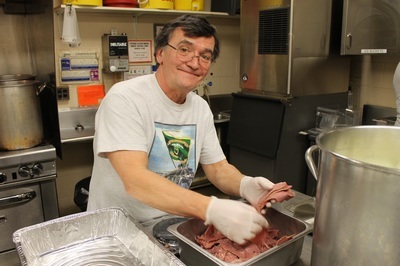 Tom is new to this area having come from Reston, Virginia just about a year ago. 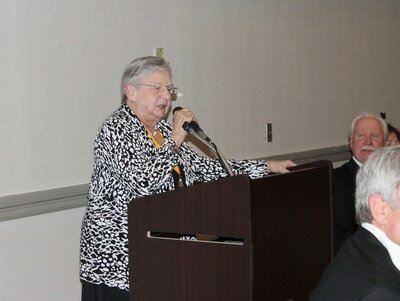 Our Organist is Kelly Ford and our Cantor is again Lynne Karl, both of whom are from St. Joseph's Church in Adrian. 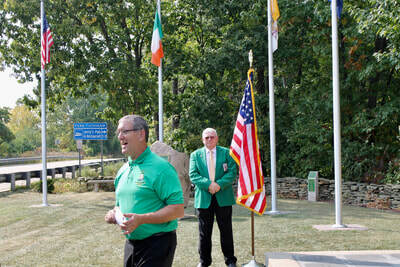 Joining us this year once again is Bagpiper Gary Blohm who will be part of the Mass celebration and afterwards for a brief ceremony at the Monument. 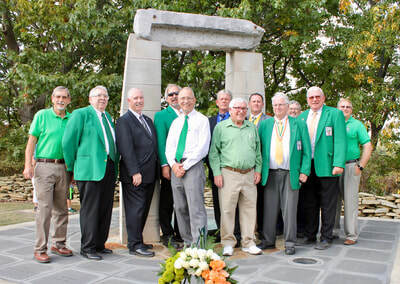 At the ceremony, attendees will be encouraged to place a wreath of remembrance at the monument in honor of our ancestors who perished during that dreadful time in Ireland's history. Please mark your calendars and plan to attend this important Hibernian event. Brothers, Sisters and Friends, if we don't do this in honor of our deceased Brethren then who will ? Also, please forward this email to your membership for the widest possible distribution. 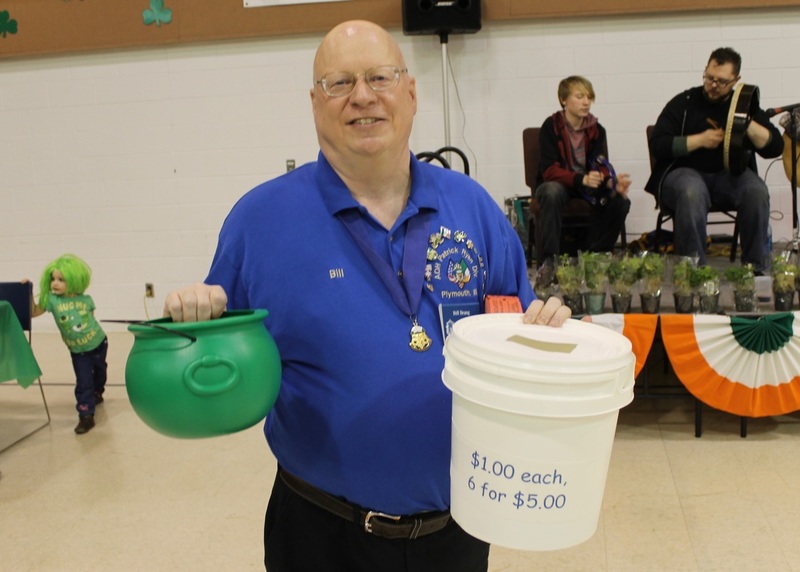 The “Souper Bowl” is our premiere fundraising event. 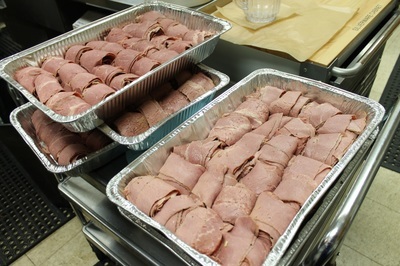 All proceeds are designated to the Capuchin Soup Kitchen. 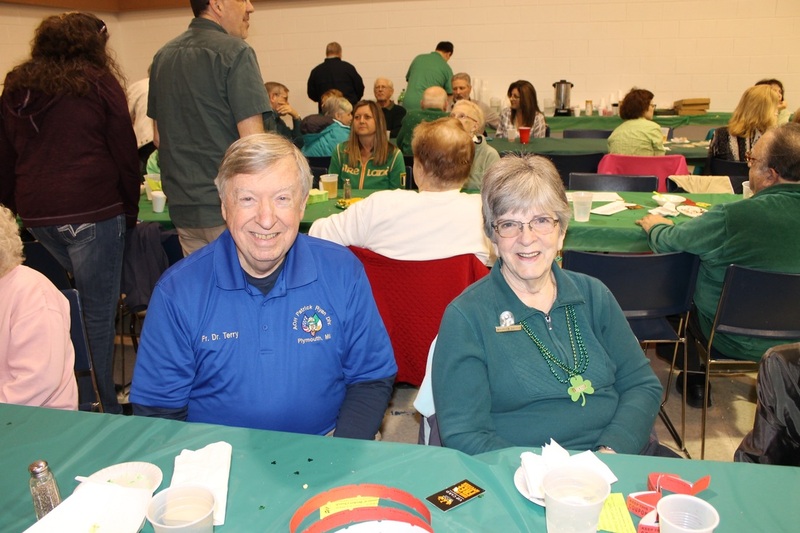 The fun will take place at the Century Banquet Center located within the American Polish Century Club , 33204 Maple Lane Drive, Sterling Heights (14 Mile & Hoover), from noon to 7:00 p.m on Sunday October 8, 2017. 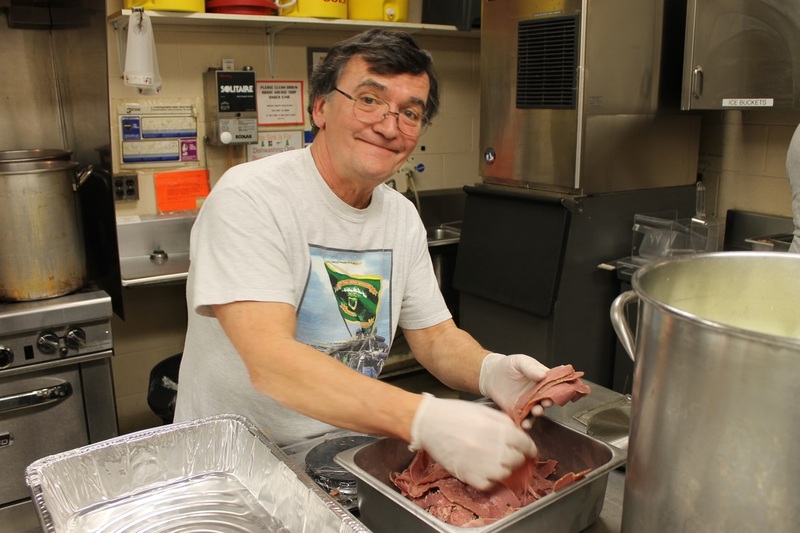 Delicious soups will be served as well as breads and baked goods – all donated by Detroit area's finest restaurants and bakeries. There will be raffles throughout the day and continuous live entertainment including the best Detroit area's Celtic bands, Singers, and Irish Step Dancers. 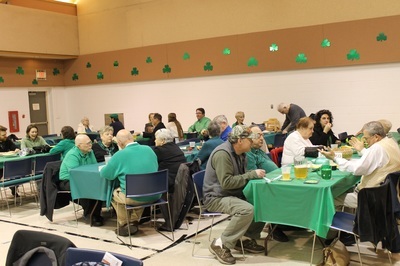 This wonderful family fun event is the result of the diligent efforts of the AOH (Ancient Order of Hibernians) Father Solanus Casey Division, and the LAOH (Ladies Ancient Order of Hibernians) Ethel Kennedy Division, both of Macomb County. 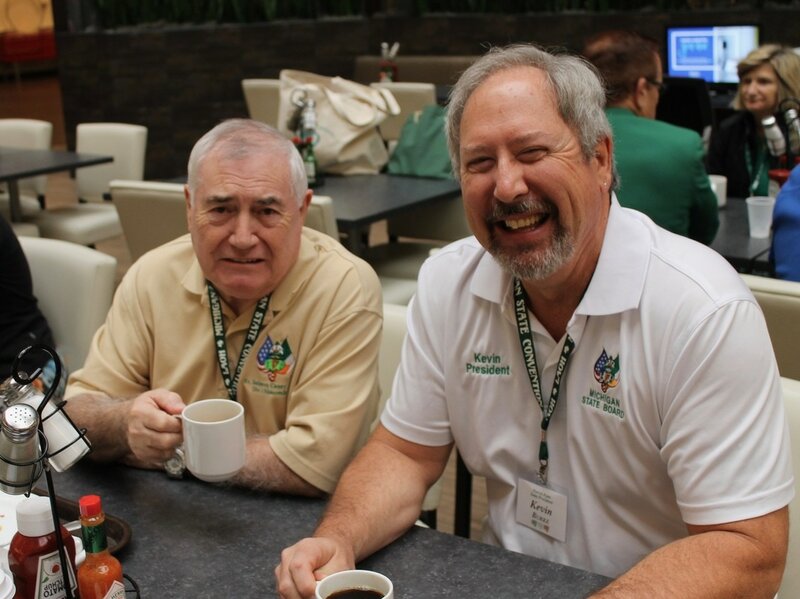 Our mission as Hibernians is to promote Friendship, Unity and True Christian Charity in our communities. You can touch the lives of those in need by encouraging your colleagues, friends, and family to attend our lively event. 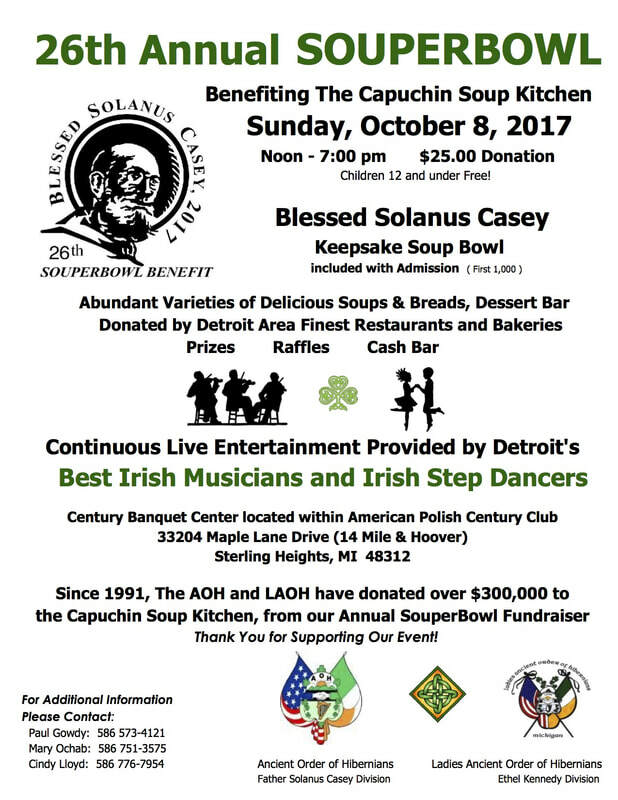 On behalf of AOH and LAOH of Macomb County and all of the needy recipients that benefit from the good works of the Capuchins, we thank you and look forward to seeing you on October 8th! This year's Lady of Knock Mass will be noon, Sunday, August 20, 2017, in conjunction with the AOH Walsh / LAOH Rose Kennedy Divisions Picnic at Handy Park, 26590 Capitol, Redford, Michigan 48239. For more information, please see email below from the LAOH State Board President. Subject: Our Lady of Knock Mass, etc. 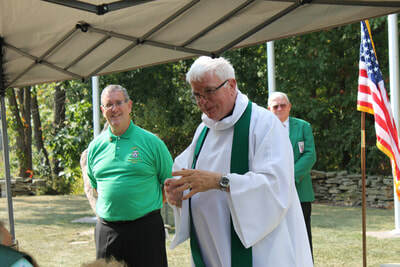 The LAOH State Mass for the Feast of Our Lady of Knock will be Sunday, August 20 at noon, at the AOH Picnic in Handy Park in Redford. Handy Park is located at 26590 Capitol, Redford 48239, and is west of Beech Daly Rd., and north of Plymouth Rd. 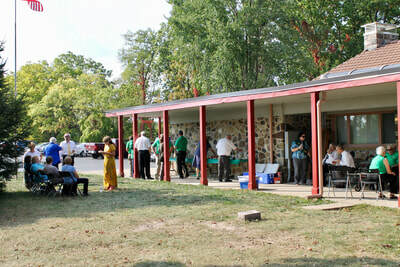 You are most welcome to stay for the picnic after Mass. If you do, please bring a dish to pass. A flyer will be coming soon, just wanted everyone to mark their calendars. 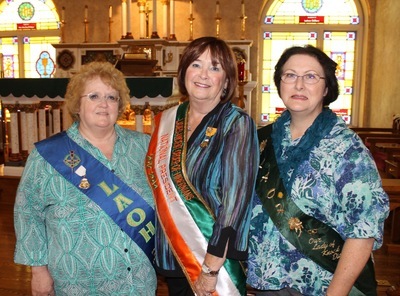 The LAOH Sr. Annette Marie Byrne Division is also hosting an Our Lady of Knock Mass on Sunday, August 20. It sounds lovely! Saturday - July 8, 2017 - Mark your calendars!!! One event on the calendar you should not miss and that is the Fr. Kelly Concert at Old St. Patrick's Irish Church which takes place on July 12th. 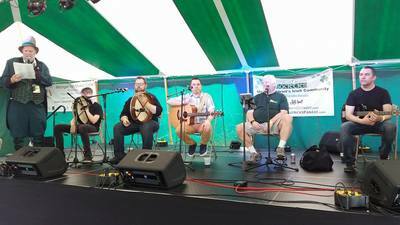 Saturday - June 17, 2017 - Lots of fun going on at the Motor City Irish Festival. There are still two more days of entertainment, food and fun! Come today and/or tomorrow! See the flyer below on this page for more details. Saturday - June 17, 2017 - Want to golf, have some fun and support the James O. Flynn Division? 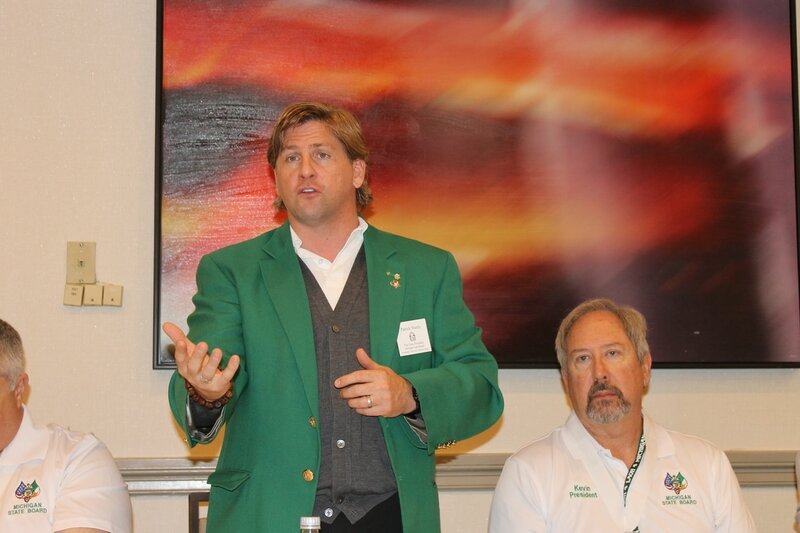 Sign up for their annual golf outing on August 18th! See the flyer below for the details. 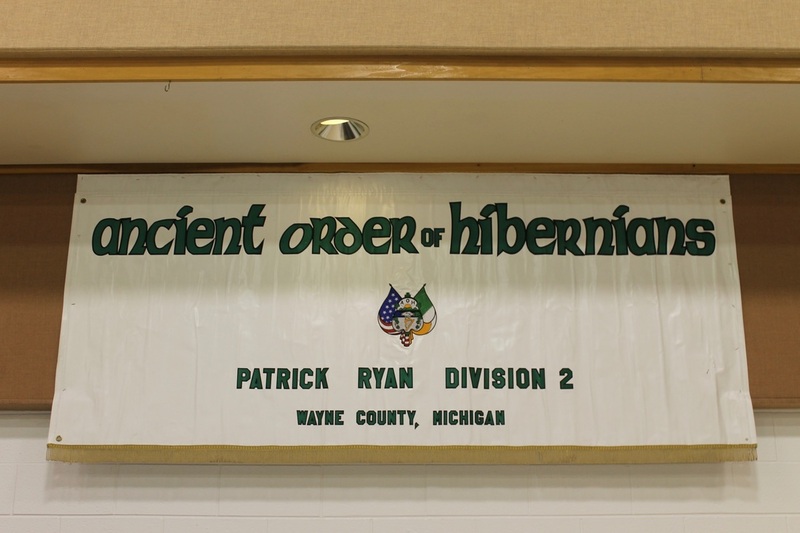 Congratulations to the following Hibernians who completed their Major Degrees and passed the test of our Order this past Saturday (MAY 20, 2017) in conjunction with the AOH Michigan State Convention in Livonia. William Kelly, Fr. Whalen McGee Div. Ryan McGinn, Fr. 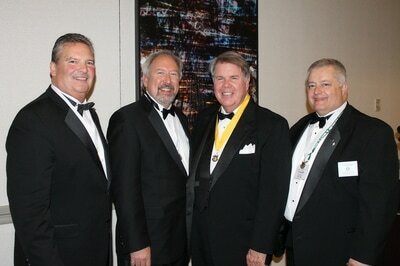 Whalen McGee Div. Paul Mueller, St. Patrick Div. A special Thank You to the following who served as part of the Degree Team. 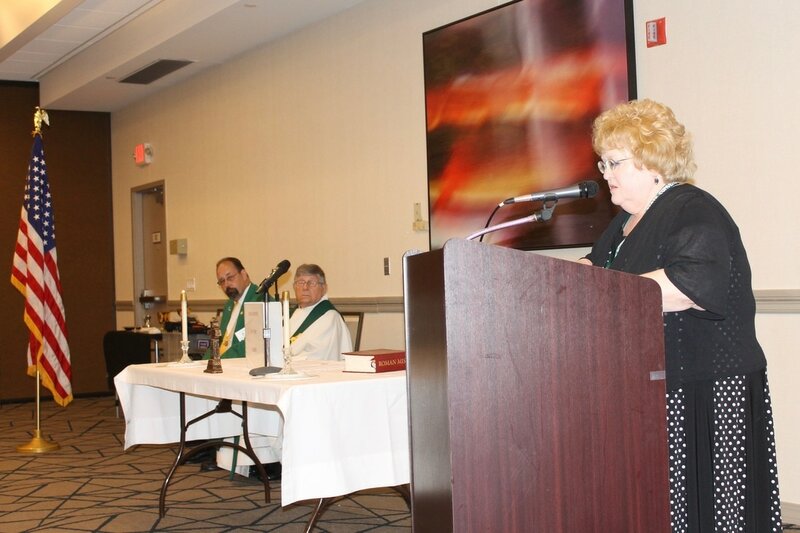 If you missed it, your next opportunity to take or observe the Major Degrees will be in Louisville Kentucky, during the next National Convention on Saturday, July 14, 2018. Congratulations to all. Well done. 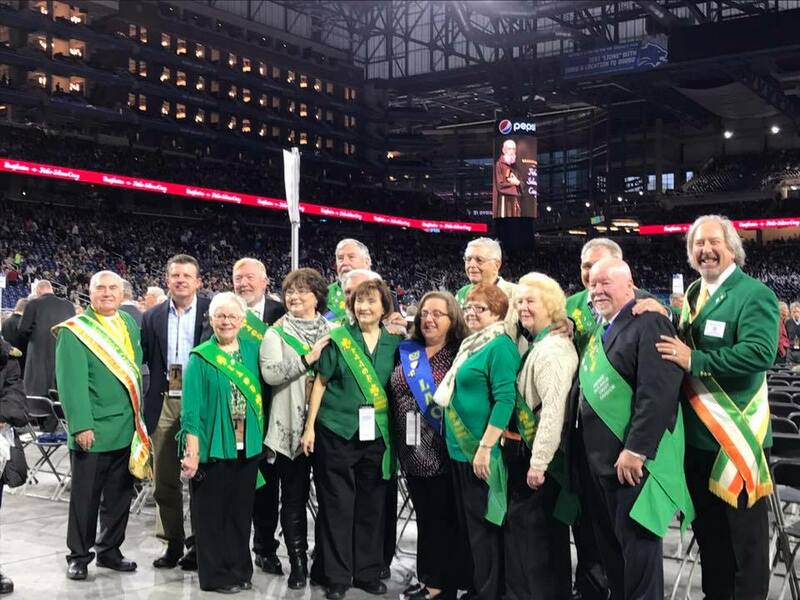 Friday - May 19, 2017 - Convention time is here! 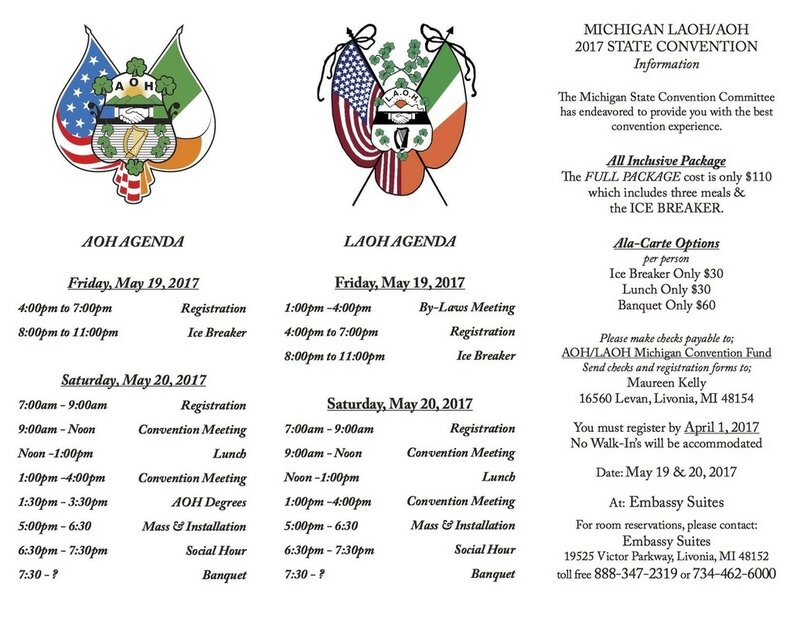 The bi-annual Michigan State AOH/LAOH State Convention starts tonight with registrations beginning at 4:00 pm and the Ice Breaker event starting at 8:00 pm. Below is the convention schedule for the weekend. Motor City Irish Fest 2017 - June 16th, 17th and 18th - Come join the fun and entertainment! National President Judge James McKay is attending our AOH Michigan State Convention May 19 & 20, 2017 at the Embassy Suites in Livonia Michigan. NOW is your last chance to attend the convention and meet President McKay. We are only two weeks away from what will be one of our best conventions to date. Please forward to your membership. 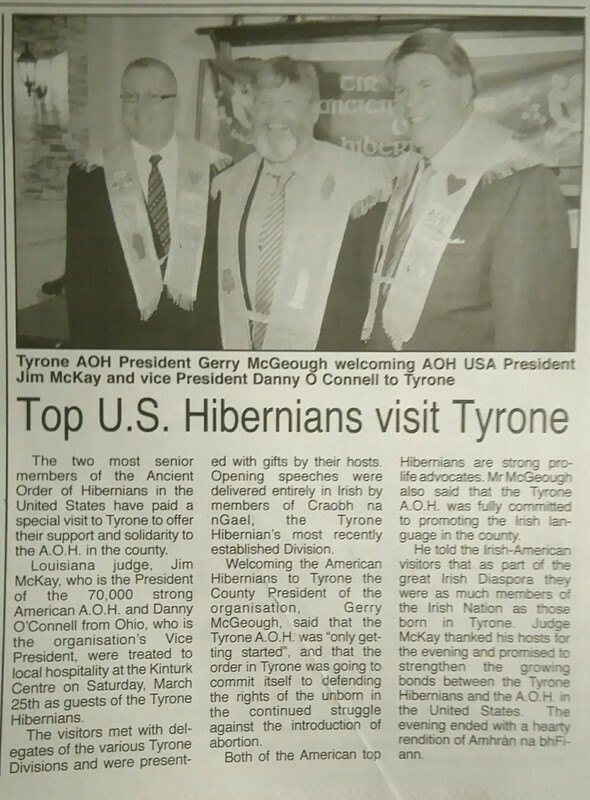 Top U.S Hibernians visits Tyrone. Tuesday - March 21, 2017 - Martin McGuinness (1950–2017) - May he Rest in Peace! 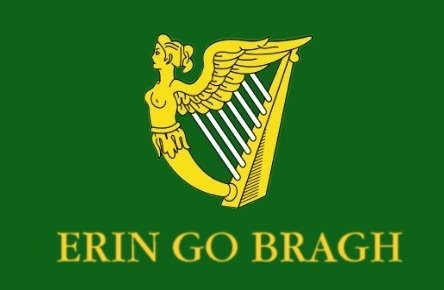 Martin McGuinness was a member of the Pioneer Total Abstinence Association, which meant that he did not drink alcohol. In December 2016, McGuinness was advised against making a planned visit to China on medical grounds, initially announcing that this was due to "unforeseen personal circumstances". After subsequent tests, he was told that he was suffering from "a very serious illness". McGuinness and Sinn Féin declined to give details of his illness to the media. In January 2017, The Irish Times disclosed that McGuinness was suffering from amyloidosis, a rare incurable disease that affects organs. McGuinness complained that the Times had breached his privacy. For more on his life, click here. 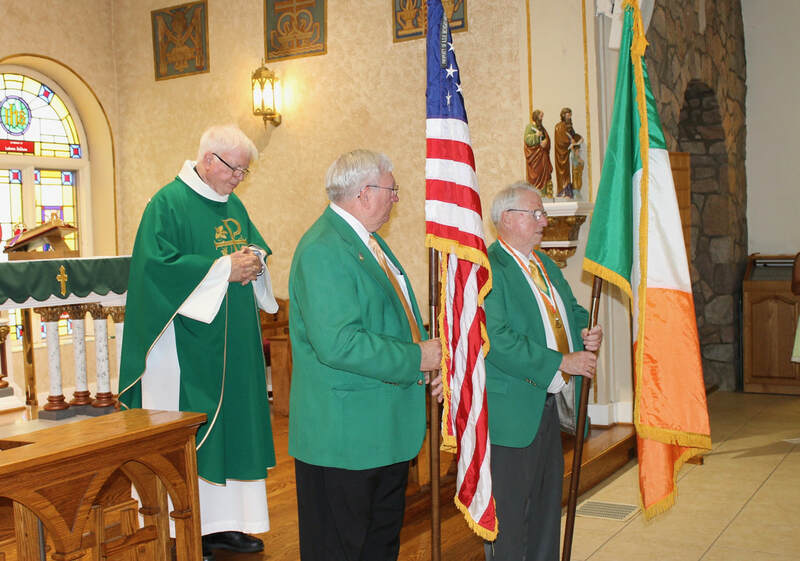 Friday - March 17, 2017 - The AOH Michigan Rifles were present at the "Sharin' of the Green" Mass at Most Holy Trinity Church in Corktown today. 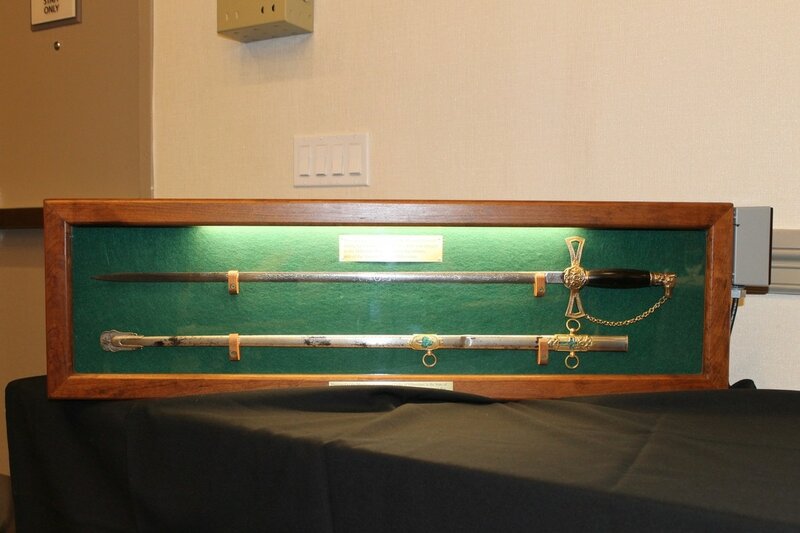 The Rifles have the privilege of escorting the Archbishop in and out of Mass each year. 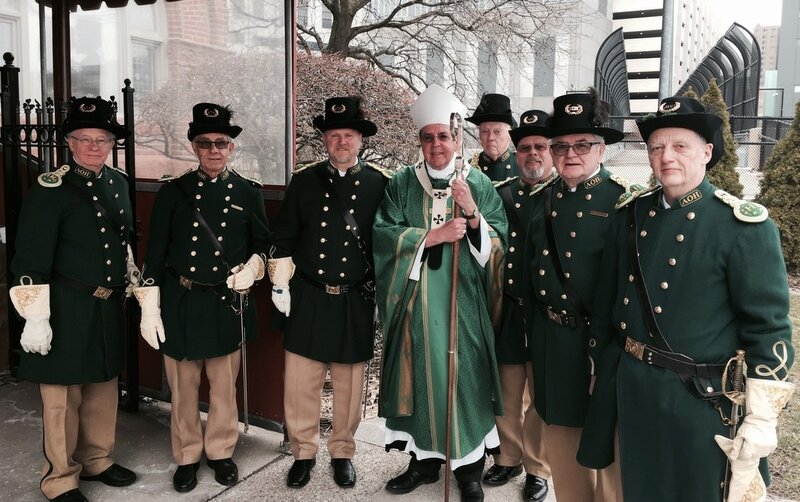 Pictured below are this year's troopers posing with Archbishop Vigneron before processing into church. 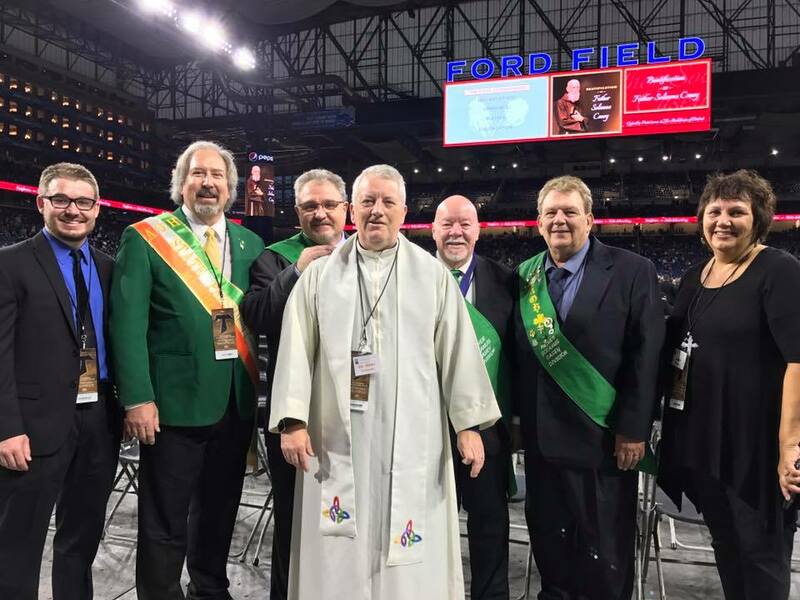 Left to Right - Brian Murphy, Mike Riley, Bob Yancey, Archbishop Vigneron, Cortland Book, Joe Bittner, Patrick Maguire and Tim Reade. Good work, men! Looking good too! 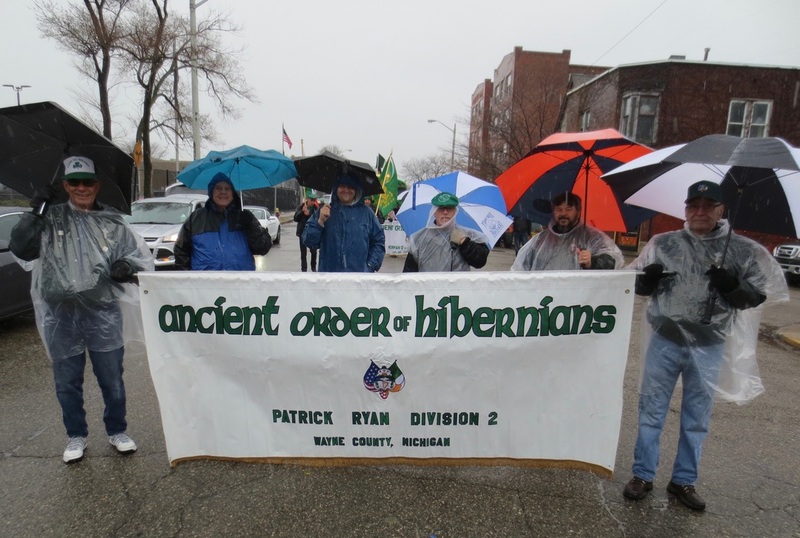 Monday - March 13, 2017 - A fine group of Irishmen at yesterday's Detroit parade! Left to right: Tim Higgins, Paul Gowdy, Kevin Burke, Tom Kish, Mark Gunn and Mike Spencer. Not pictured, but there and taking this pick...Rick St. Peter. 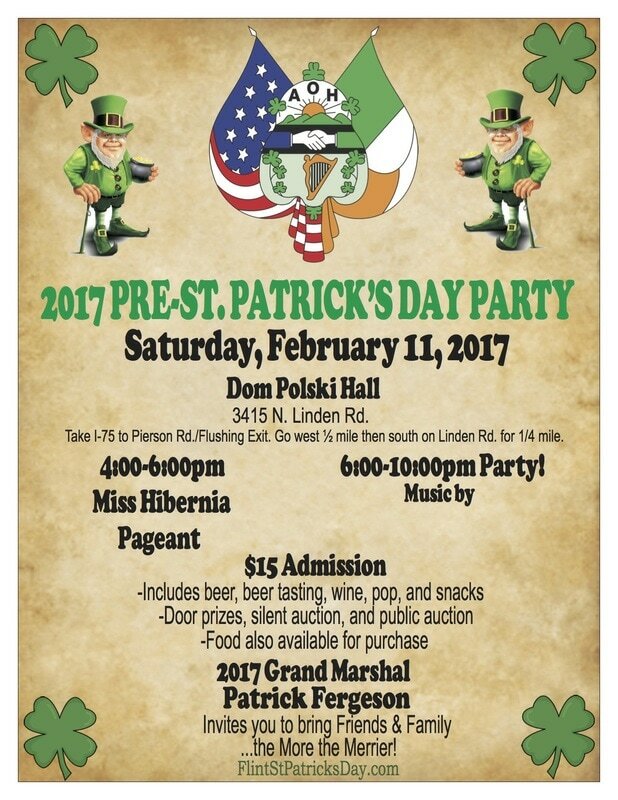 Friday - February 24, 2017 - If you are in the area, please attend the St. Patrick's parade in Royal Oak, MI on March 11th. 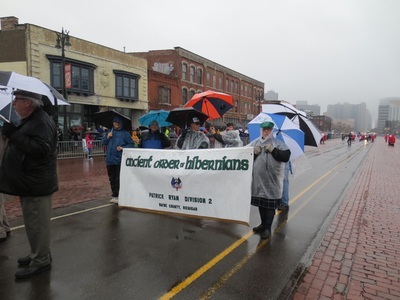 AOH Norman O'Brien Division has been the sponsor of this parade for years. The parade kicks off downtown on Washington Avenue at 11:30 am. 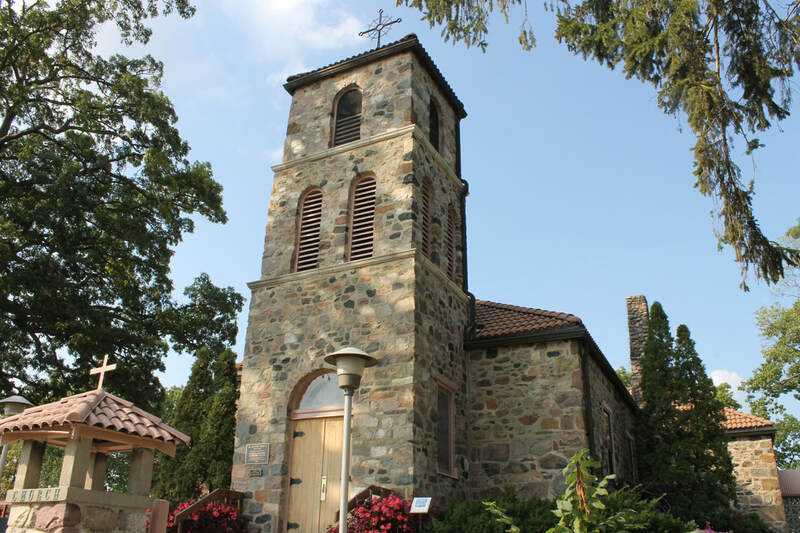 Tuesday - February 21, 2017 - The AOH Msgr. Flannery Division from Gaylord Michigan is having their "17th Annual St. Patrick's Day Irish Celebration" on Saturday, March 4th. See the information below. This event sells out every year, so get your tickets now. Tuesday - February 21, 2017 - St. Patrick Division in Adrian is having our annual St. Patrick's party on Saturday, March 18, 2017 at St. Mary's Activity Center in Adrian starting at 6:30pm - tickets are $15.00 and children under 8 are free. 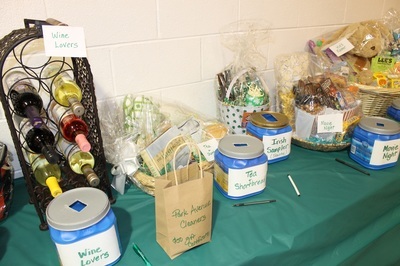 We are having snacks, a DJ, Step Dancers from Toledo, a silent auction and dancing till Midnight. 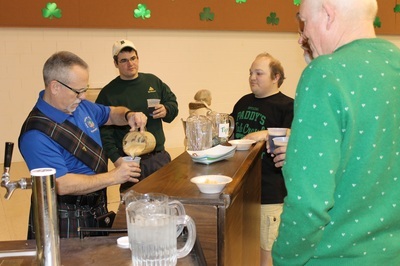 Beer, wine and Irish coffee will be available. 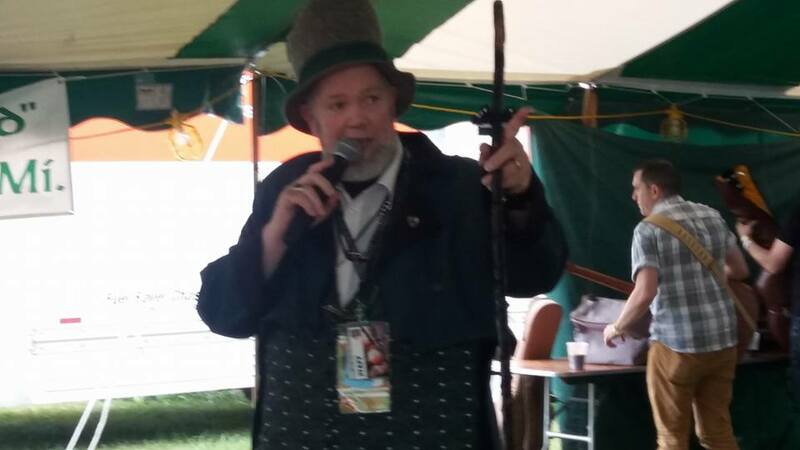 Anyone that wants advanced tickets can call Gary at (517) 902-4689. All proceeds go to St. Vincent DePaul and St. Mary's food pantries and AOH. 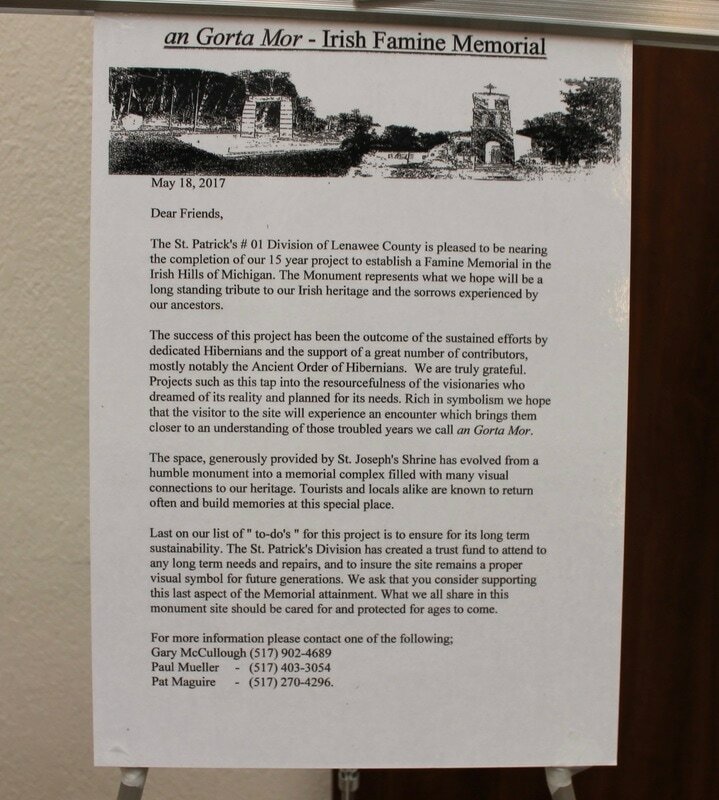 Attached is a flyer. 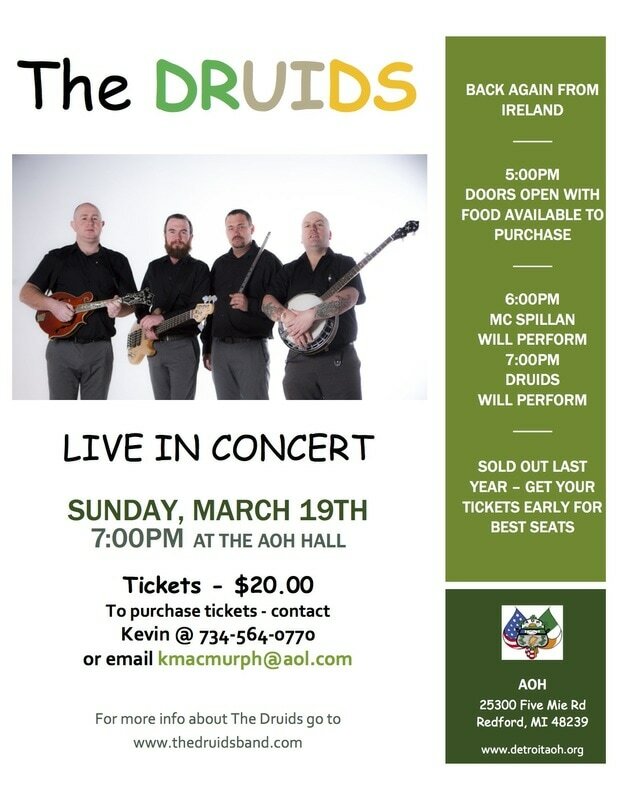 Tuesday - February 14, 2017 - Live in concert on March 19th...The Druids! If will be a fun night. Check the flyer below to get your tickets now! 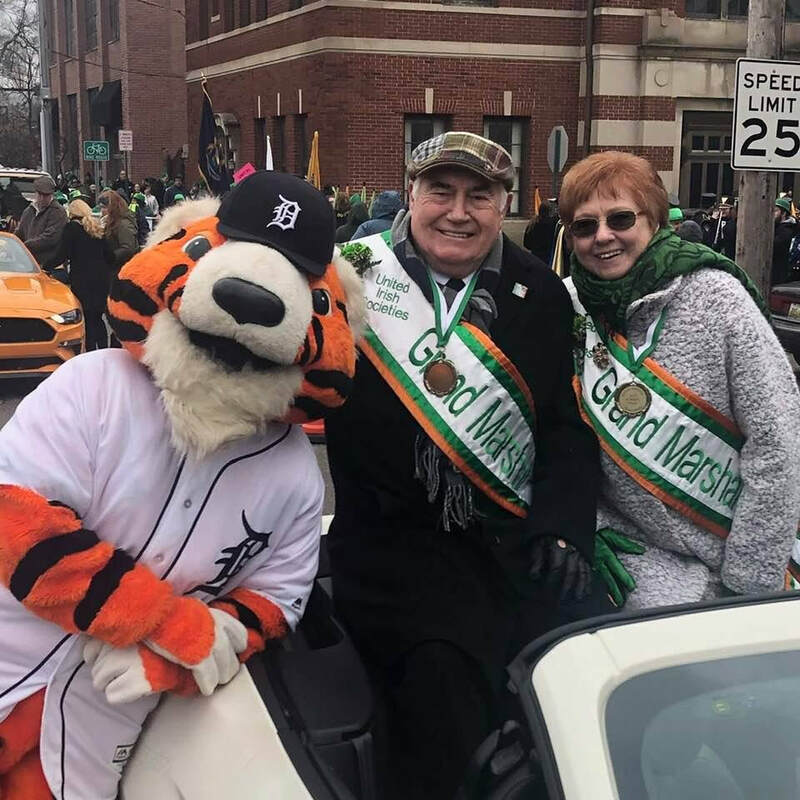 Monday - January 30, 2017 - Congratulations to Brian Dunleavy of the AOH Dunleavy Division (20WA04) on being named Grand Marshall of the 2017 St. Patrick's Parade in Detroit! 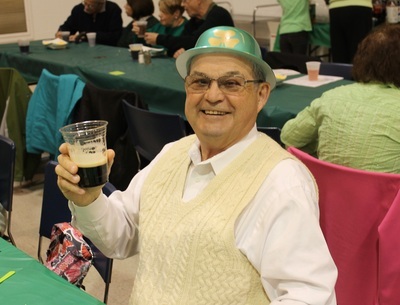 Please consider attending the fundraiser described below at Walsh Hall on February 9th to raise funds for Holy Trinity School, and at which Brian will be honored. Monday - January 16, 2017 - Here's a note from the Sullivan and O'Sullivan Division in Genesee County. Please consider attending their Pre-St. Patrick's Day Party on February 11th if you are able! See the flyer below for all the details. 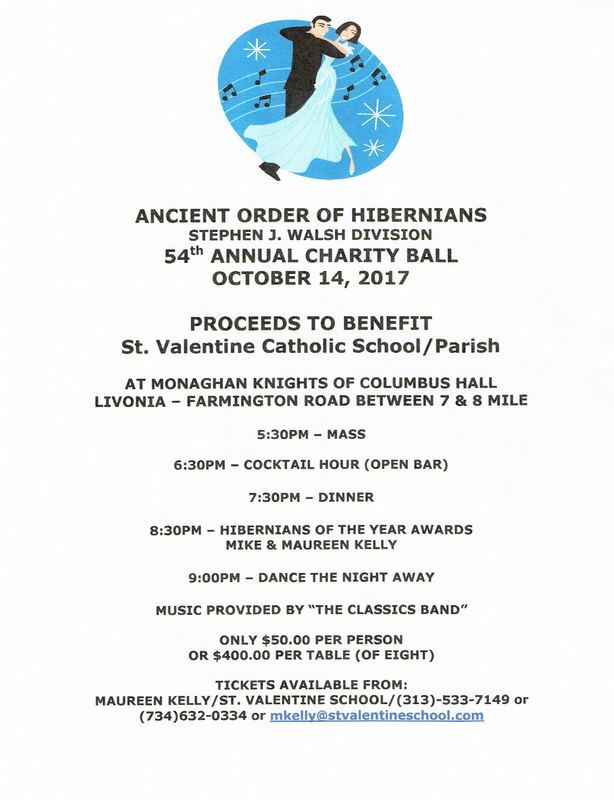 Here is the flyer for the Sullivan and O’Sullivan Division Pre-St. Patrick’s Day Party that you were asking about, That party just keeps getting better! I hope you guys and your wives can attend. 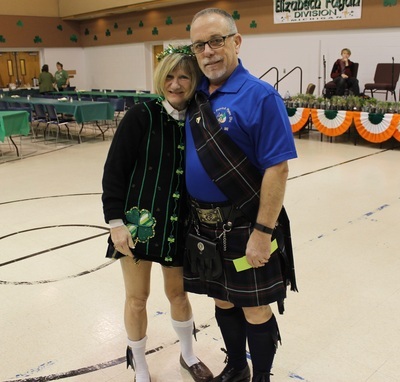 You would honor us by your presence – and have a grand Irish time into the bargain! Saturday - January 14, 2017 - The AOH/LAOH Michigan State Convention will take place on May 19th and 20th this year at the Embassy Suites Hotel in Livonia. 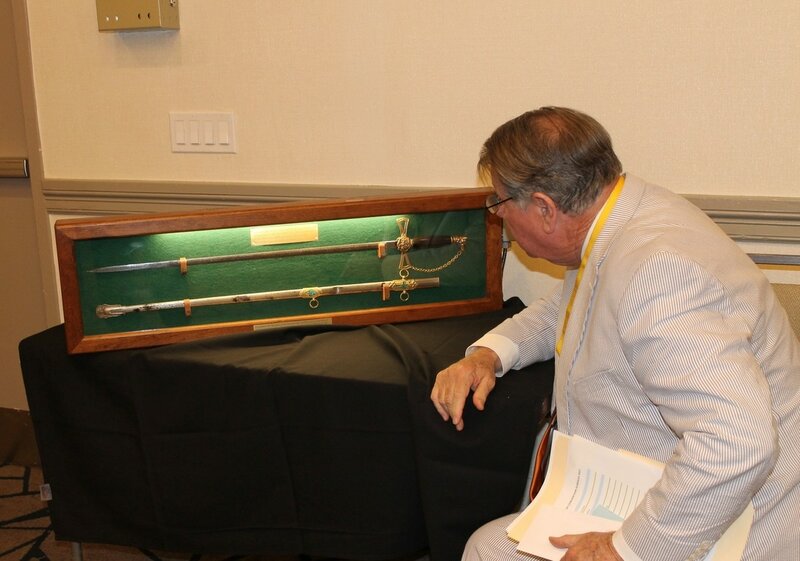 Download a copy of the official convention brochure and application here! Registrations should be sent in by April 1st. An AOH Major Degree ceremony will take place on Saturday at 1:30. This is a great time to get your major degree! Friday - January 13, 2017 - Come join us for a night of Irish fun on January 28th at the AOH Hall in Redford! 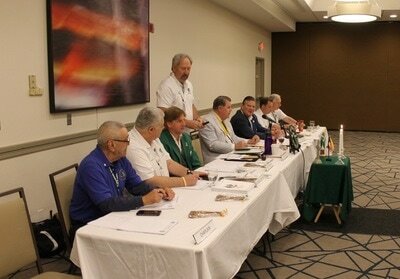 Have a good time and help support the AOH Michigan State Convention coming this May. See the flyer below for all the details. Click on the "download" icon to get a pdf copy of the fundraiser application and register your team soon! 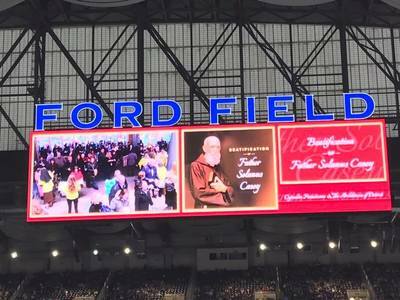 January 2017 - Michigan in the National News - Sullivan & O'Sullivan, Solanus Casey and Patrick Ryan divisions highlighted! ​Wednesday - May 4, 2016 - Remembering the heroes of the Easter Rising...on May 3rd, 4th & 5th in 1916 they met their fate. May they rest in peace. 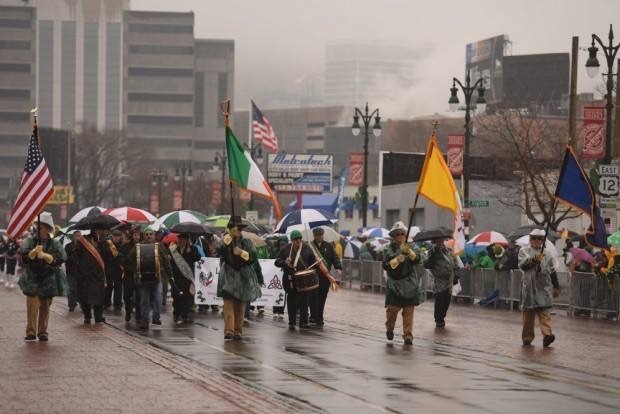 2016 Detroit St. Patrick's Parade - Sunday, March 13th! On Sunday January 31st, members of several AOH and LAOH divisions gathered at St. Robert Bellarmine Church to honor St. Brigit. St. Brigit is the patron saint of the LAOH and next to St. Patrick, the most revered saint of Ireland. Click on the pictures here to see larger versions.